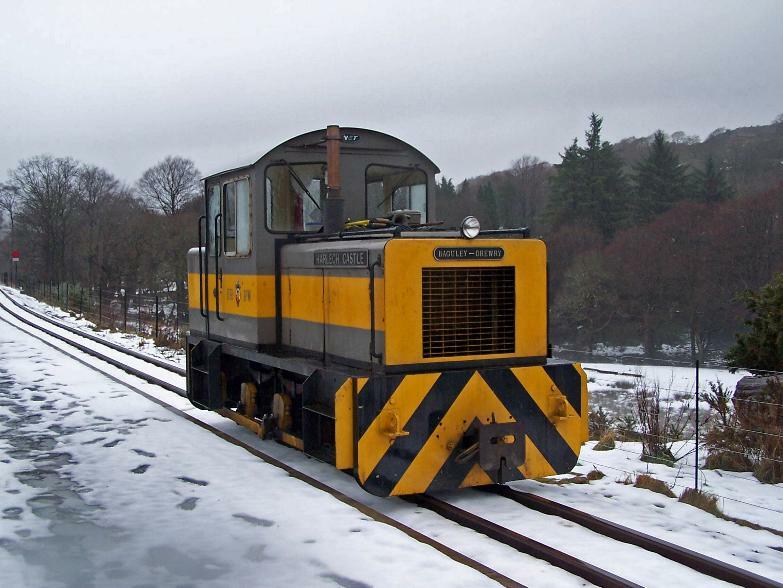 This was at the first winter in a while to produce snow whilst trains were running. Snow appeared in mid-December and again in the early Spring. 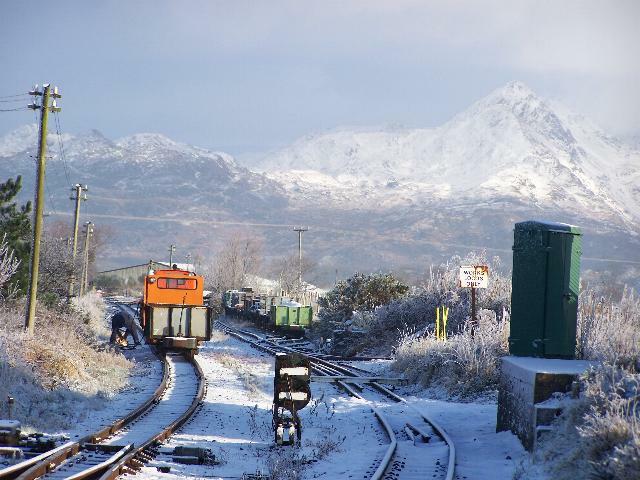 A coal train ran from Dinas to Porthmadog on 8/12/17 and was noted passing Pont Cae'r Gors hauled by Vale of Ffestiniog with a dusting of snow around the summit but the mountains nicely coated in snow. A F&WHR statement on the F&WHR Facebook confirms Santa trains will run as booked with no snow issues. This southerly view (8/12/17) shows Vale of Ffestiniog hauling four coal wagons just south of Pont Cae'r Gors from Dinas to Porthmadog. Snow can be seen on Moel Hebog above Beddgelert. Click on the image to enlarge and click again to see full size (where available). This image is copyright Michael Rowe and was taken on a quadcopter camera. Image post processed and displayed at 96dpi. Although the SVR had to cancel Santa Specials on Sunday due to the weather, the WHR offered normal services with snow building up at Rhyd Ddu and Beddgelert. The mountains around Rhyd Ddu and Beddgelert had a good covering and the lying snow lead to Xmas Card scenes. Bacon baps were available at the Dinas cafe. Any photos would be welcome for publication as your webmaster cannot get there because of a dose of flu, this after religiously getting the flu jab! 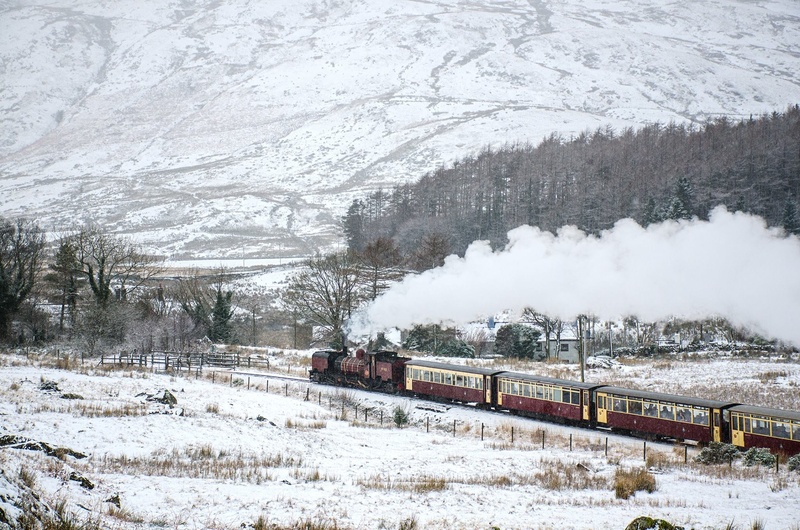 For images of trains in the surprisingly light snow at Rhyd Ddu on Saturday 9/12/17 see WHR fan Facebook page. There was much more snow on Sunday 10/12/17 and it did produce some Xmas Card scenes in both the Aberglaslyn Pass and at Rhyd Ddu. 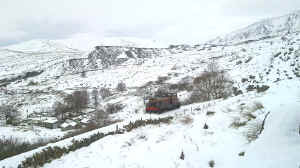 This easterly view (10/12/17) shows No.138 hauling the Dinas-Rhyd Ddu Santa Special rounding Ffridd Isaf curve in snowy conditions. Click on the image to enlarge and click again to see full size (where available). This image is copyright F&WHR and was taken on a digital camera. Image post processed and displayed at 96dpi. This westerly view (10/12/17) shows No.138 hauling the Dinas-Rhyd Ddu Santa Special approaching Rhyd Ddu in snowy conditions. Click on the image to enlarge and click again to see full size (where available). This image is copyright F&WHR and was taken on a digital camera. Image post processed and displayed at 96dpi. 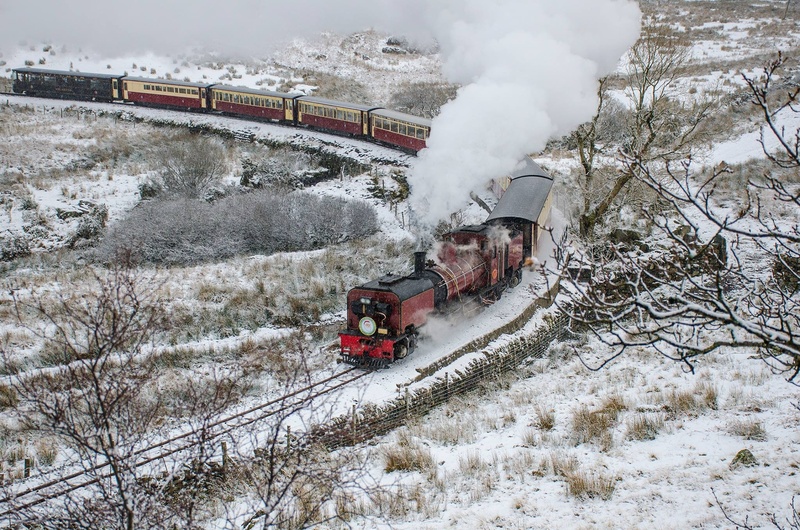 This northerly view (10/12/17) shows No.138 hauling the Dinas-Rhyd Ddu Santa Special entering Rhyd Ddu in snowy conditions with Merry Christmas headboard. Click on the image to enlarge and click again to see full size (where available). This image is copyright F&WHR and was taken on a digital camera. Image post processed and displayed at 96dpi. This northerly view (10/12/17) shows No.138 hauling the Dinas-Rhyd Ddu Santa Special at Rhyd Ddu in snowy conditions. Santa can be seen walking down the platform! Click on the image to enlarge and click again to see full size (where available). This image is copyright F&WHR and was taken on a digital camera. Image post processed and displayed at 96dpi. 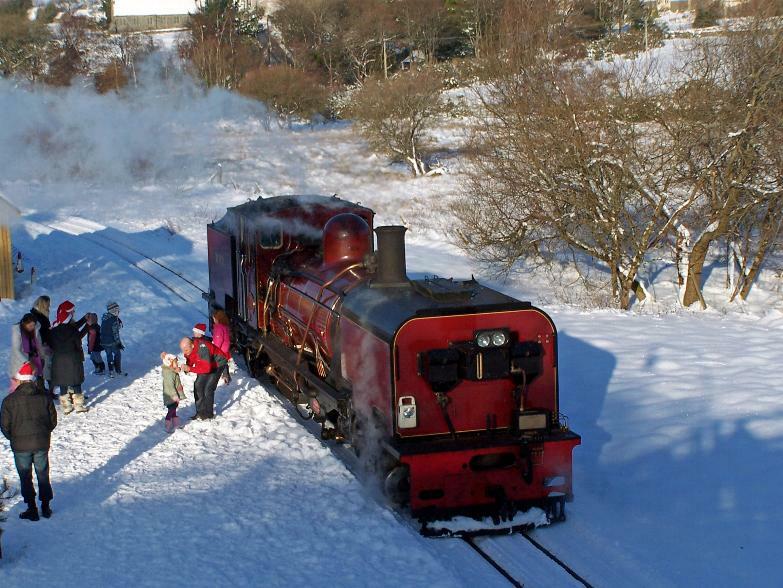 Meanwhile the Porthmadog-Beddgelert Santa Special ran after a track inspection by Lyd. 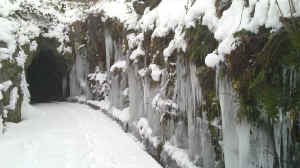 In previous snowy years large icicles have formed in the four tunnels, particularly Goat Tunnel. After finding no problems, the loco returned to Pont Croesor to pilot Earl of Merioneth to Beddgelert. 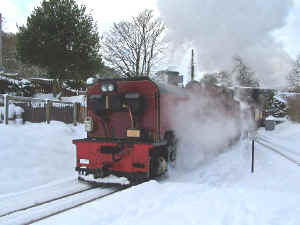 Pont Croesor loop is currently out of use so the return working from Beddgelert is performed using Lyd as the train locomotive, retaining Earl of Merioneth on the rear, which then hauls the set back from The Cob into the more sheltered Porthmadog Platform 1 rather than the WHR Platform 2. 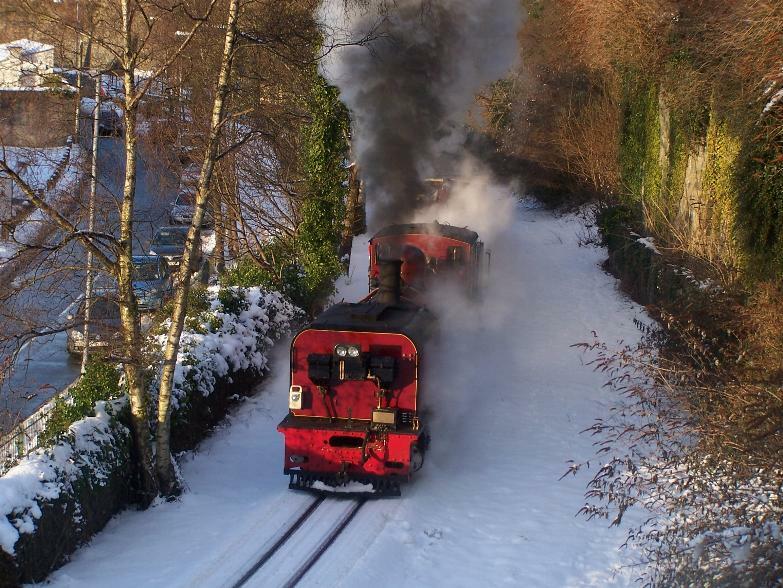 The same pair of locos is rostered for the remaining Porthmadog-Beddgelert Santa Specials. This northerly view (10/12/17) shows Lyd on an inspection working before piloting the Porthmadog-Beddgelert Santa Special descending the Nanmor bank. Click on the image to enlarge and click again to see full size (where available). This image is copyright F&WHR and was taken on a digital camera. Image post processed and displayed at 96dpi. This southerly view (10/12/17) shows Lyd double heading Earl of Merioneth with the Porthmadog-Beddgelert Santa Special ascending the Aberglaslyn Pass. Click on the image to enlarge and click again to see full size (where available). This image is copyright F&WHR and was taken on a digital camera. Image post processed and displayed at 96dpi. Although there was widespread snow in the Midlands on 27/12/17, North Wales only experienced snow at higher levels. Green timetable trains operate from Dinas to Beddgelert twice a day at 1015 and 1335 with a 30 minute break at Beddgelert. A return service from Beddgelert departs at 1200 with a 25 minute break at Dinas. Cold snowy weather returned on 27/12/17 and 21/1/18 in some parts of the country with heavier snow from 22/2/18-3/3/18 that lasted a week in some places and a final flurry around 18/3/18 but sadly, while there lying snow at Porthmadog, unfortunately it missed the 2 weeks of Half Term Holiday trains by being a few days late, so no images of trains in snow have come to hand for February. 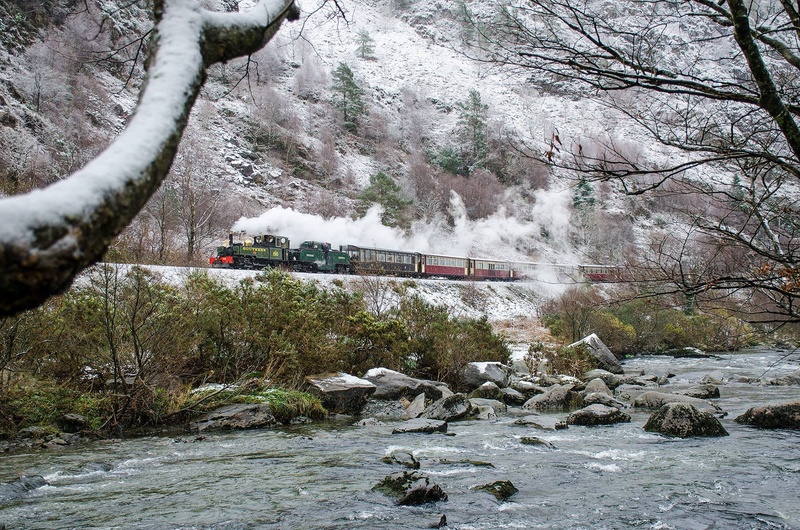 No pictures were offered from March snowfall as trains only operated to Hafod-y-llyn which is at seas-level and so unlikely to have lying snow. This southerly view (28/2/18) shows the new formation being ballasted against the extended platform face. Snow lies on the platform and undisturbed parts of the track. Click on the image to enlarge and click again to see full size (where available). This image is copyright Dai Jones and was taken on a digital camera. Image post processed and displayed at 96dpi. Winter 2016-17 was another mild one with little snow around the WHR yet again! Neither the Sana Trains nor the mince pie specials ran in the snow. Finally it seemed Rhyd Ddu area was predicted some snow on Thursday evening 12/1/17 and all day Friday 13/1/17 at Snowdon Ranger. It was forecast to remain cold for the week ahead too. Sadly there were no trains running unless there were departmental workings. 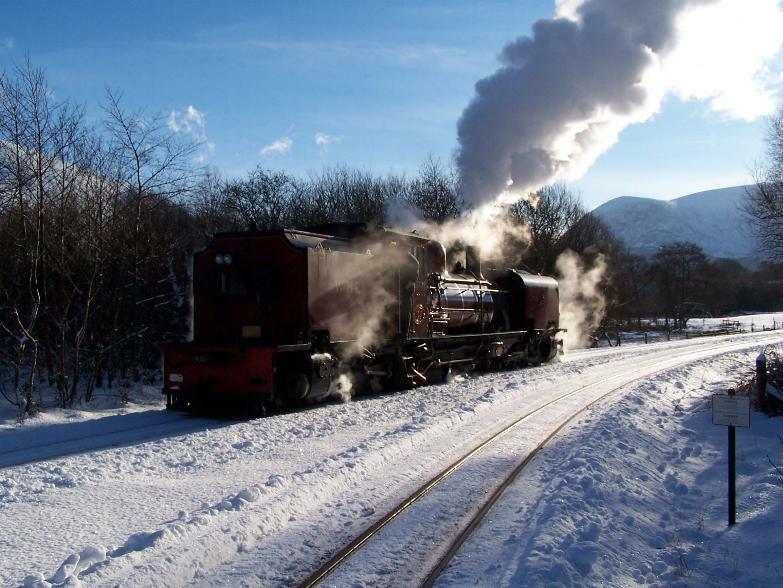 After a cold several days with surprisingly little snow the Met Office predicted temperatures of 8-9oC around Rhyd Ddu for the first three days of the Half Term services 18-19/2/17. Sadly it seems there will be cloudy/drizzly conditions and mild temperatures around the WHR when many were hoping for snow at Half Term. 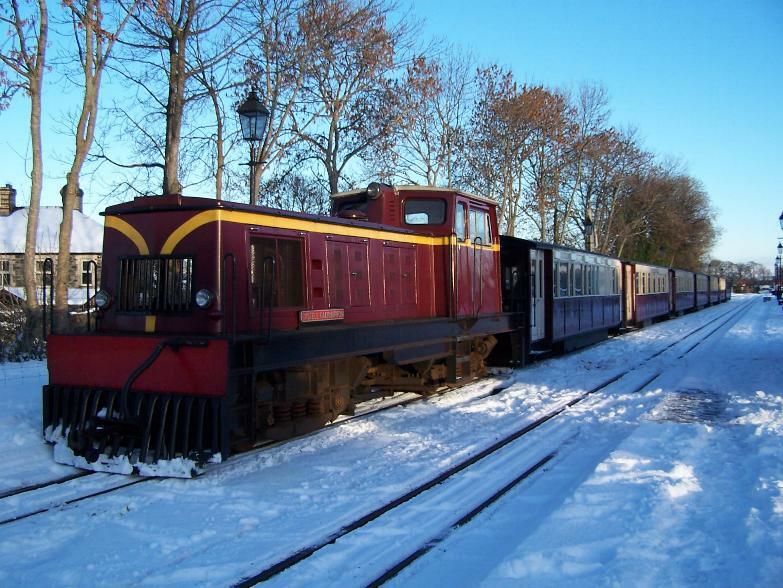 So another year with no trains in the snow! Again Winter 2015-16 followed the experience of recent winters in being relatively mild and occasionally very wet, rather than snowy. No images of trains in the snow have been received though the mountains had occasional coverage of snow in January and February providing an alpine backdrop. 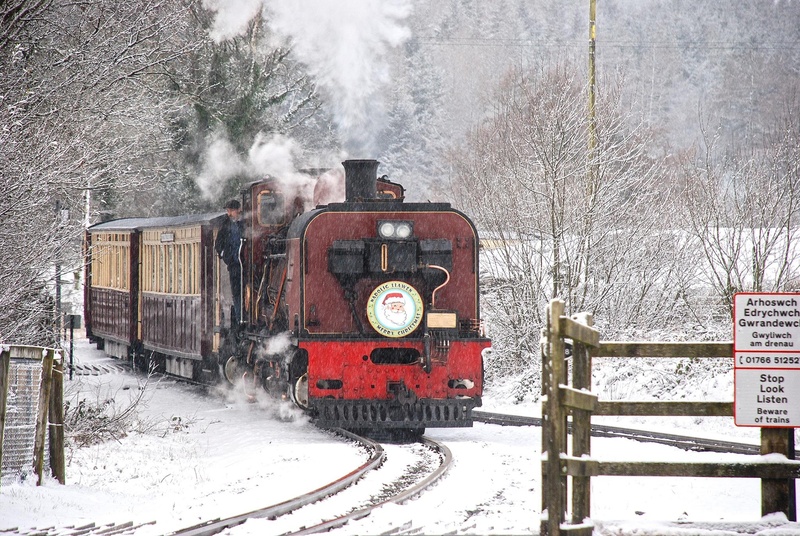 Again Winter 2014/15 was very mild and the lack of trains operating in the February Half Term holiday yet again reduced the chances of photography of trains in the snow to just the Santa Trains and the Xmas-New Year 6 days. 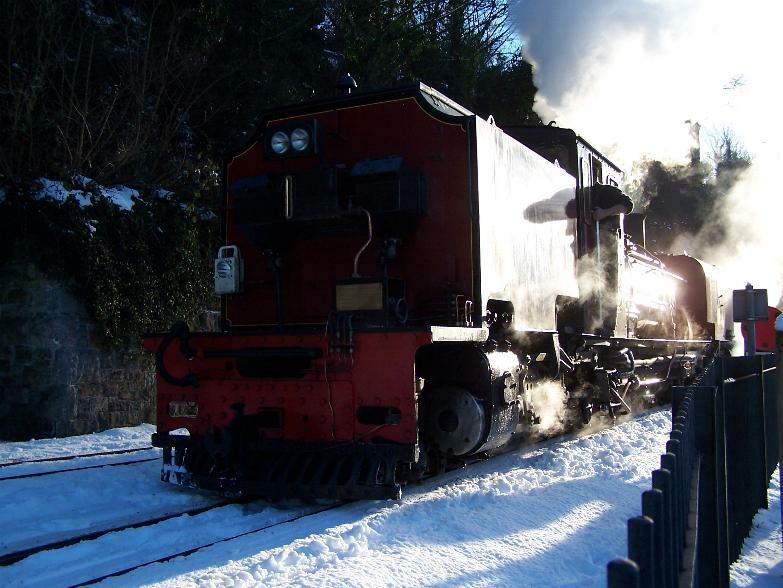 Snow did not reach down to the railway on any operating days but the mountains sometimes provided alpine snowclad scenery. This easterly view (29/1/15) shows there has been a heavy snowfall around Rhyd Ddu with the weather unusually from the south. 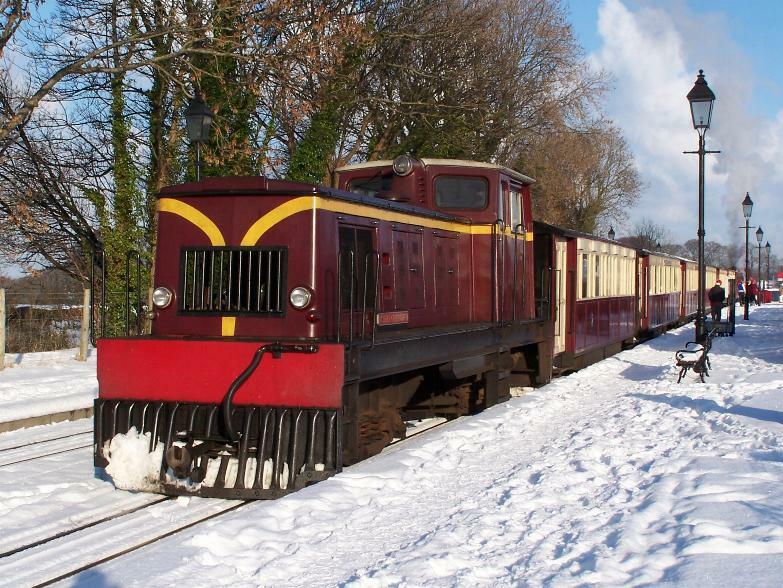 The lack of train services over February Half term (a common time for snowfall) has severely reduced the opportunities for photographs of trains in the snow other than the occasional works train. Click on the image to enlarge. This image is copyright F&WHR and was taken on a digital camera. Image post processed and displayed at 96dpi. This southerly view (27/12/14) shows No.87 passing the summit with snowclad Moel Hebog in the background. Click on the image to enlarge. This image is copyright Alasdair Stewart and was taken on a digital camera. Image post processed and displayed at 96dpi. Winter 2013-14 was very mild with little snow around the WHR or even adorning the Snowdon massif and average temperatures above normal in early 2014. No images have come to hand of trains in the snow. 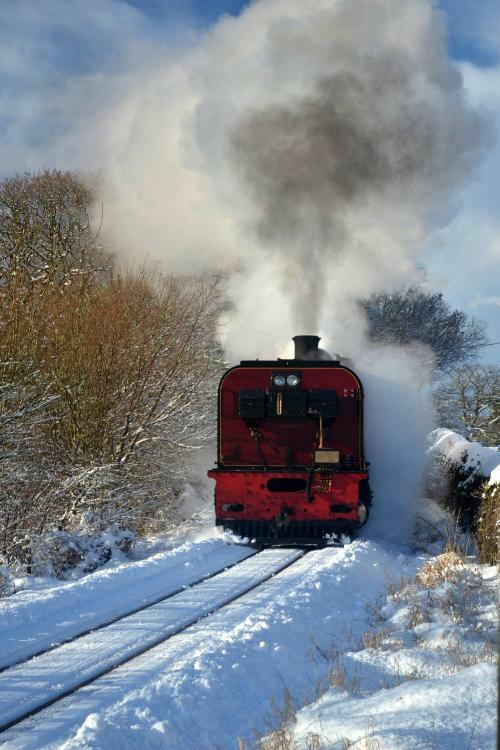 Another year with no February Half Term holiday trains left few opportunities for images of trains in the snow. Temperatures were below normal at the start of November 2012 and with changeable weather a snowfall is likely anytime around the WHR. 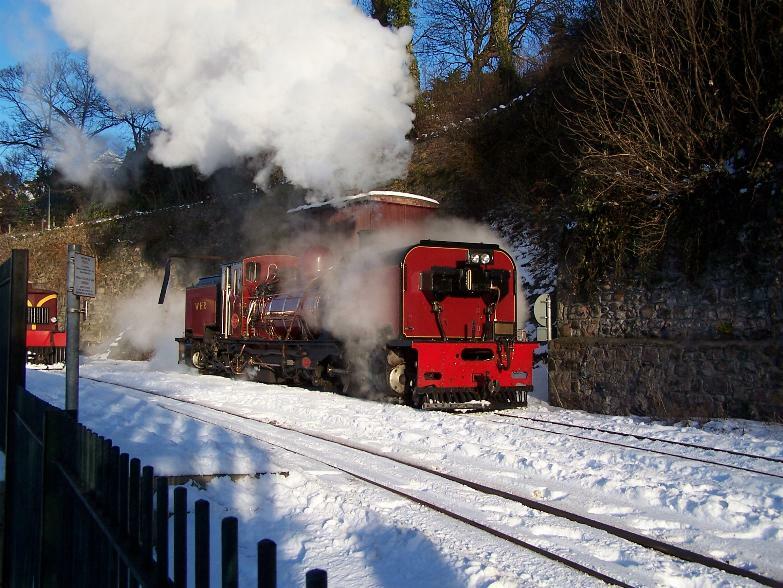 Unfortunately there was no snow for the Santa Trains or even on the higher sections over the Xmas holidays and there are no trains in 2013 until March except works trains. 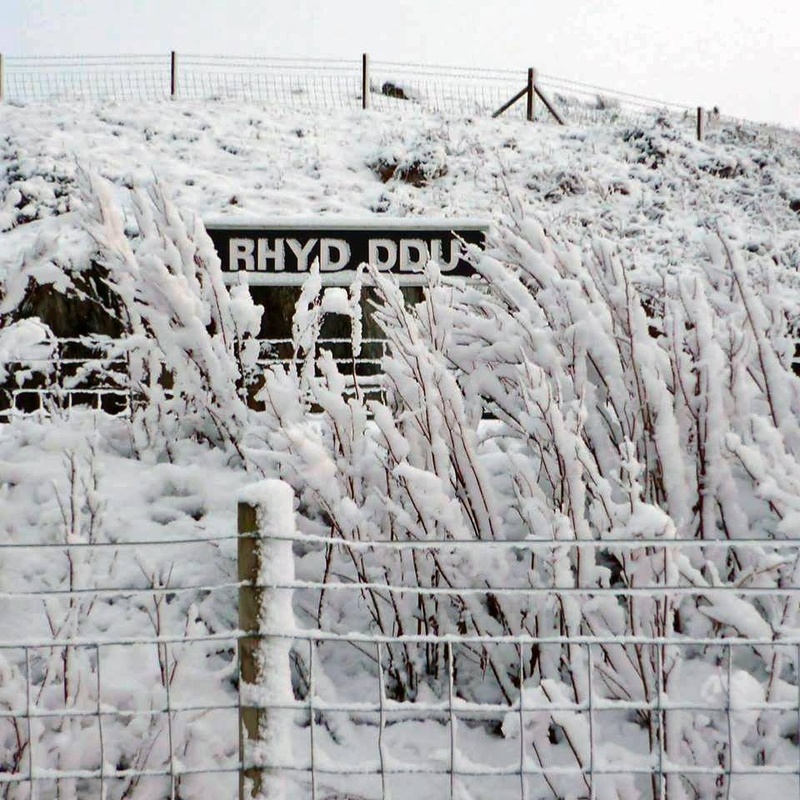 A heavy snowfall on 18/2/13 left lying snow across the WHR, even in Porthmadog. This was a poor Winter for snow after being spoilt by the 2010/11 heavy snowfalls, though these were effectively all in late 2010. Nevertheless there were a couple of short lived blizzards which left lying snow around the WHR on 19/2/12 and as late as 4/4/12 (see below). 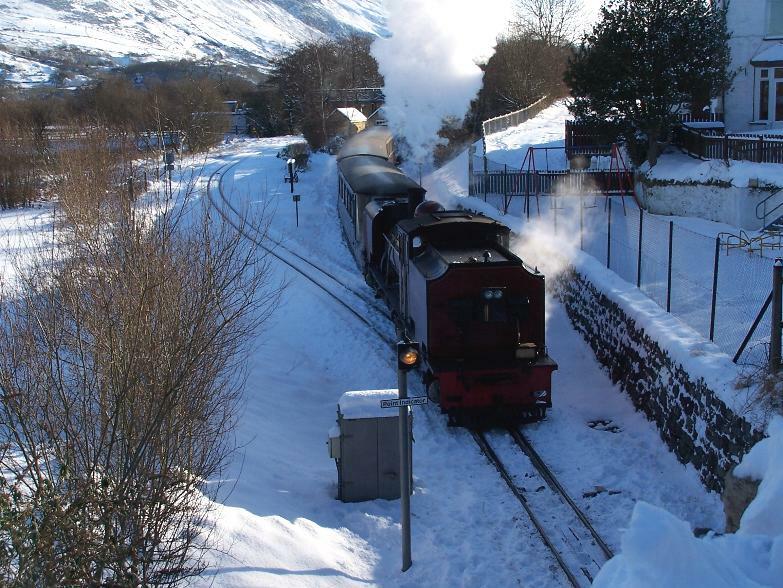 There was an unusually late season blizzard on 4/4/12, possibly the latest snow fall ever recorded since the WHR opened, with the morning trains struggling through a blizzard at Rhyd Ddu. It had melted away by the late afternoon. Click on the YouTube box above to watch 9 mins 41 secs of video of the F&WHR on 3-5/4/12, including some snow scenes. This video was taken by Simon Roberts on a camcorder and is best viewed at 720p HD standard. 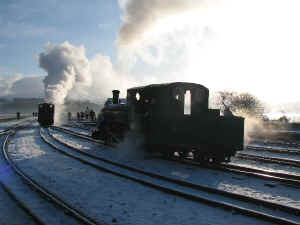 The final day of the Half Term trains saw sunshine and snow showers around the WHR. 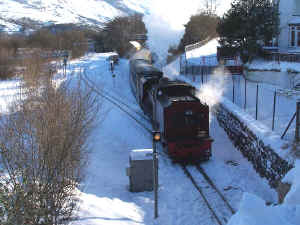 This southerly view (19/2/12) shows No.87 leaving Rhyd Ddu with a snowy background at midday. This may be one of the only snow scenes this Winter as the 1cm of snow was rapidly melting and it was the final day of Half Term Holiday trains. Click on the image to enlarge. This image is copyright Dr. Simon Melhuish and was taken on a digital camera. Image post processed using Zoner Photo Studio 13 and displayed at 96dpi. Saturday 11/2/12 saw the start of the Half Term Holiday train service with two trains a day between Caernarfon and Porthmadog from each direction. The service is being hauled by Nos.87 and 143. See F&WHR website for full details. Saturday 18/2/12 does not have a service, usually a sign that the train has been chartered for a group. Snow is at a premium in North Wales this year and may only be seen on the mountaintops. Temperatures are rising and may be as high as 8oC by mid week. 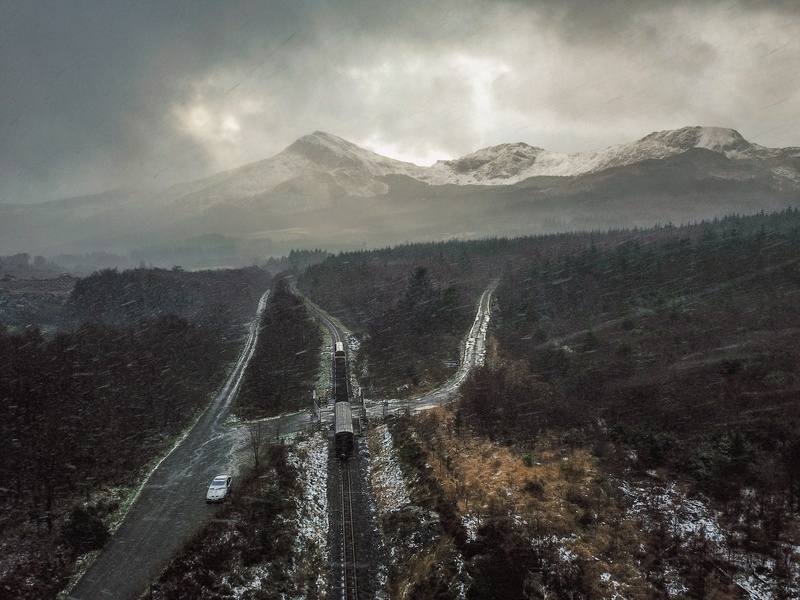 While snow may have covered many areas of the Midlands, South and East of the UK, the Saturday blizzard fell as rain around the WHR except for the mountain tops. It is still hoped that the snow line might come down to the height of the WHR for the Half Term holiday services. 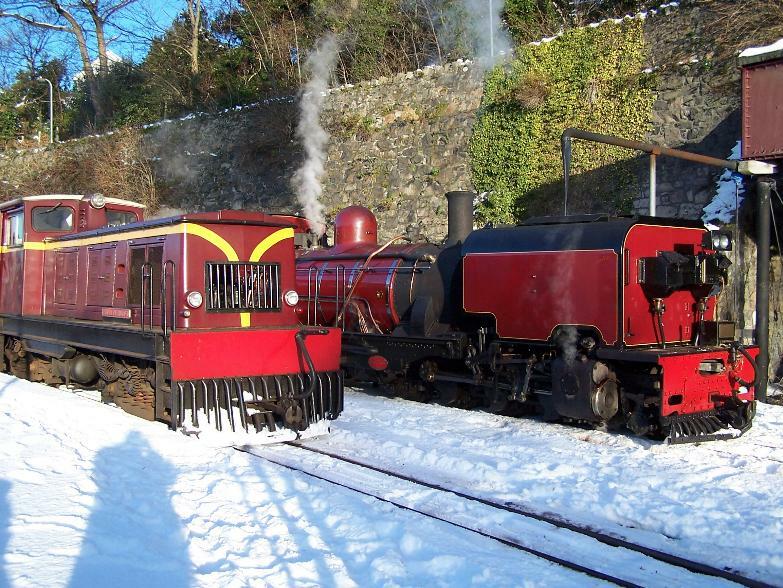 With trains operating from Caernarfon to Porthmadog during the February school holidays (from 11-19/2/12) and Porthmadog-Beddgelert weekend trips from 25/2/12, here are some useful resources to check if there is snow at the WHR. First Hydro has four webcams in the Llanberis valley. If the one pointed at Llanberis shows snow, this would give a good indication of snow in the Gwyrfai valley as they are around the same height. However, it should be noted that snow cover generally decreases from east to west. Other useful resources include the A55 webcams (pages 7-13). The Treborth Interchange (Bangor) webcam can be helpful though it is nearer sea level than the WHR. The main Meteorological Office website also has a Porthmadog/Wales page that shows the predicted weather for the Porthmadog area for the next five days. Snow for February 2012 services? 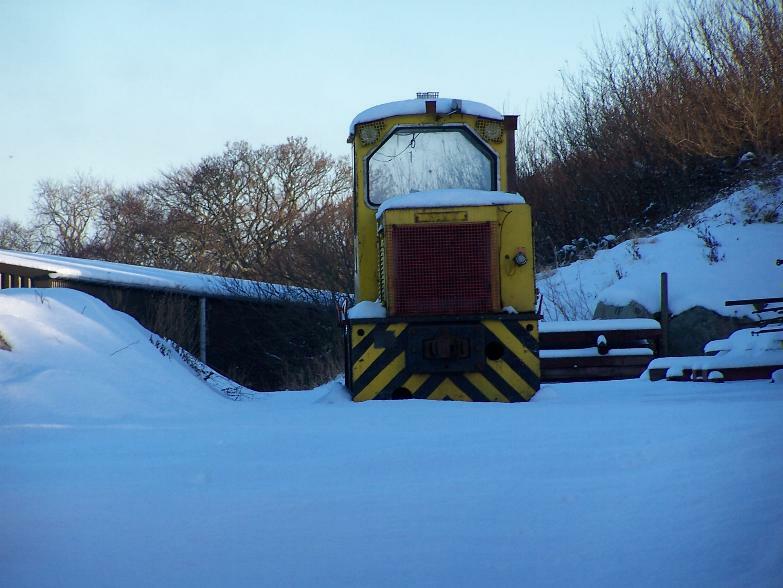 After being spoilt for snow at the end of 2010, 2011 saw no lying snow around the WHR. The latest cold snap may warm up again next week but there is plenty of time yet for Winter to bite. There will be services from 11-19/2/12 during the February Half Term school holidays (except Saturday 18/2/12 when perhaps there are specials operating?). These are the 1045/1415 from Porthmadog. A single return service is also offered from Caernarfon at 1100 which forms the 1415 from Porthmadog on its return. 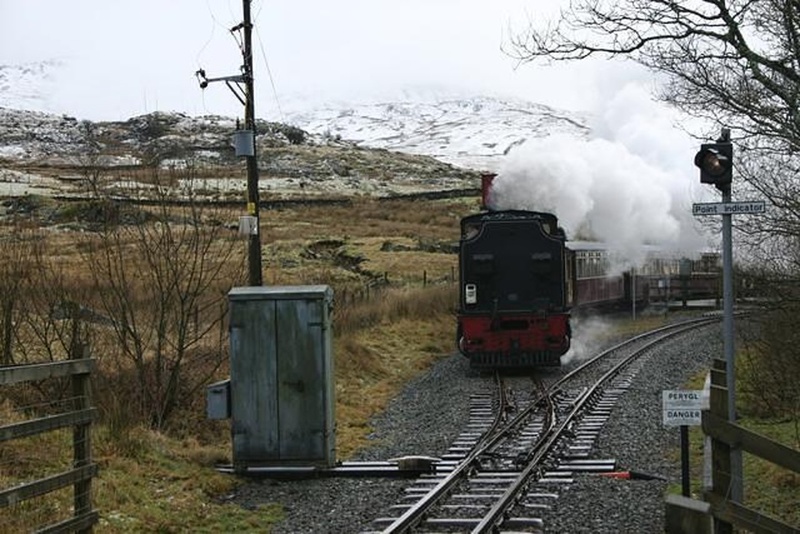 The trains cross at 1215 and 1545 at Rhyd Ddu allowing halfway journeys from both directions. The February Half Term is a common time for snow to fall in North Wales and the snow season sometimes continues into March/April. The Porthmadog-Beddgelert service (primarily aimed at coach parties) continues every weekend from 25/2/11 to the start of the new season trains on 24/3/11 with two trains at 1100 and 1415 from Porthmadog. 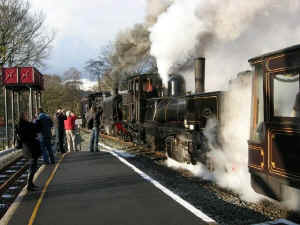 A return service from Beddgelert is possible at 1230 arriving back at 1500. The winter of 2010-11 saw many days of snow, both early in the year and in November/December. There was lying snow around the WHR from 1/1/10 for a week and later in late February, when the whole country experienced snowfall. 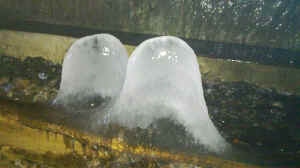 In November 2010 an early snowfall occurred across the UK and by 18/12/10 over the whole WHR where it lay 6 inches deep. 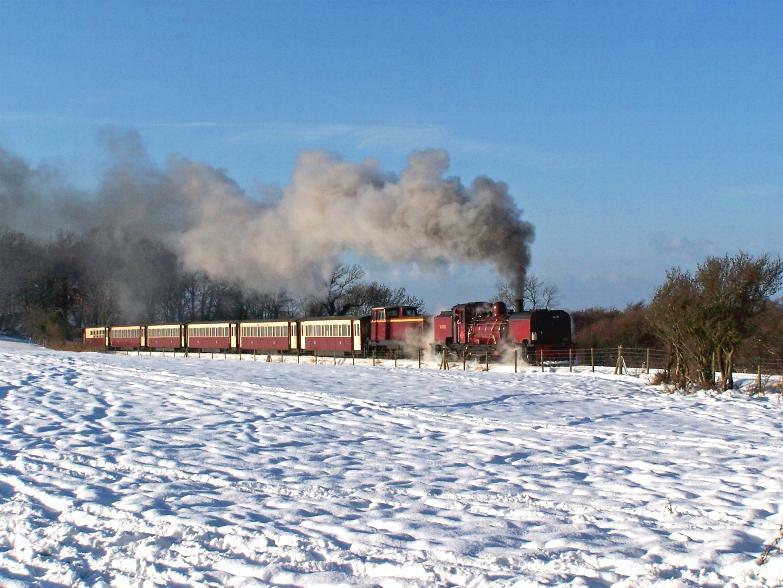 The snow lasted until the end of the year offering many chances of travelling and photographing trains in the snow. FR diesel Harlech Castle broke through the icicles in the tunnels whilst making a line inspection trip form Porthmadog to Beddgelert on 28/12/10, the first visit by the loco to the WHR. While the service train did not progress beyond Beddgelert again, Harlech Castle departed south just before No.138 returned north from Beddgelert. These northerly and southerly views (28/12/10) show Harlech Castle stabled in the northbound track at Beddgelert with snow rapidly thawing. Click on the images to enlarge. These images are copyright Barrie Hughes and were taken on a Kodak DX6490 digital camera. Images post processed using iPhoto Plus4 and displayed at 96dpi. This southerly view (28/12/10) shows No.138 with Castell Caernarfon at the other end of the train, ready to depart Beddgelert with snow still lying on the ground, though thawing fast. Click on the image to enlarge. This image is copyright Barrie Hughes and was taken on a Kodak DX6490 digital camera. Image post processed using iPhoto Plus4 and displayed at 96dpi. On the return journey, the train stopped by the TOTP cabinet and then ran through Waunfawr wrong line, possibly to water. 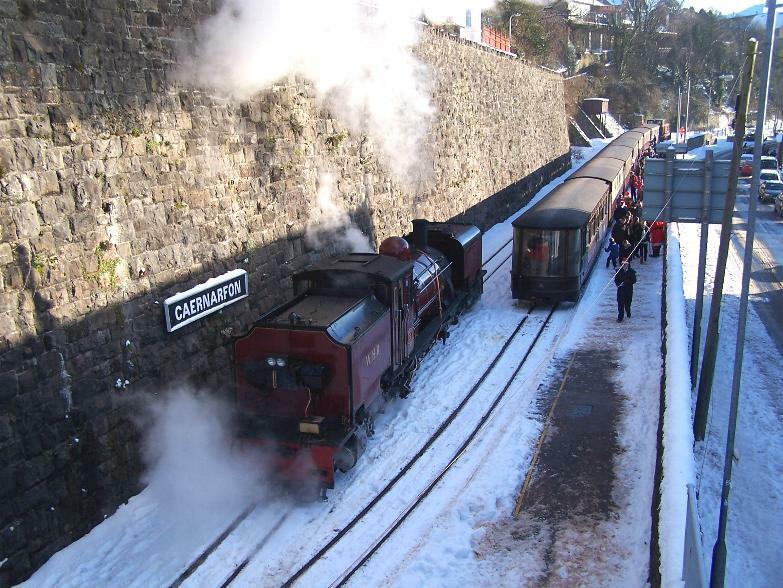 The Xmas service started on 27/12/10 with snow still on the ground at Caernarfon and No.138 paired with Castell Caernarfon. 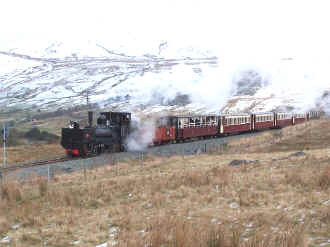 With the line blocked at Goat Tunnel and the loop out of action at Beddgelert, No.138, ran around to the rear of the train at Rhyd Ddu and the Funkey led the rake downhill. An attempt to water at Beddgelert was unsuccessful as the valve was jammed, despite the locos chimney being placed under it for 10 minutes! Passenger numbers were relatively light (despite the alpine snowclad scenery), although the roads to Caernarfon were clear. 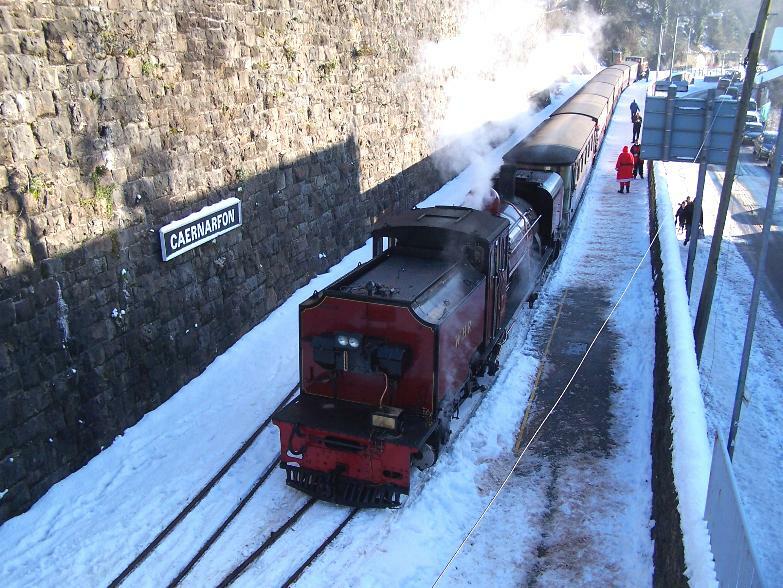 This northerly view (27/12/10) shows No.138 with Castell Caernarfon at 1100, departing Caernarfon with snow still lying on the ground, though thawing fast. No.138 was substituting for the booked K1. Click on the image to enlarge. This image is copyright Barrie Hughes and was taken on a Kodak DX6490 digital camera. Image post processed using iPhoto Plus4 and displayed at 96dpi. 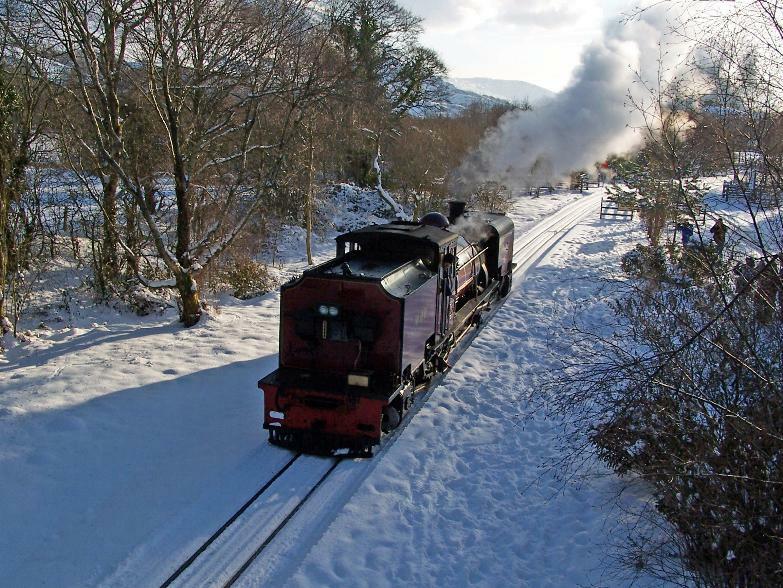 This westerly view (27/12/10) shows No.138 with Castell Caernarfon at 1119, passing Cae Moel with snow still lying on the ground, though thawing fast. Click on the image to enlarge. This image is copyright Barrie Hughes and was taken on a Kodak DX6490 digital camera. Image post processed using iPhoto Plus4 and displayed at 96dpi. 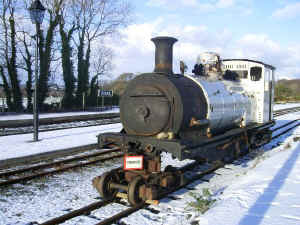 This northerly view (27/12/10) shows No.138 with Castell Caernarfon at 1145, passing Salem with snow still lying on the ground. Click on the image to enlarge. This image is copyright Barrie Hughes and was taken on a Kodak DX6490 digital camera. Image post processed using iPhoto Plus4 and displayed at 96dpi. 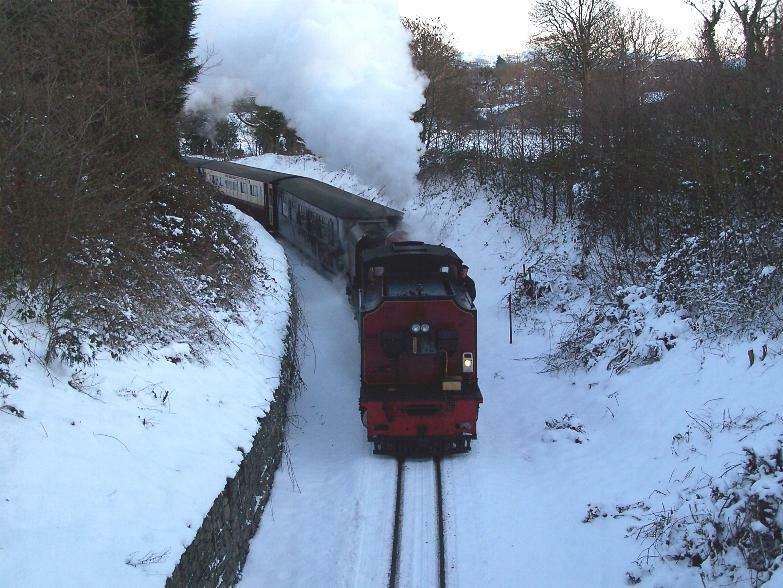 This northerly view (27/12/10) shows No.138 with Castell Caernarfon at 1151, passing Castell Cidwm with snow still lying on the ground. Click on the image to enlarge. This image is copyright Barrie Hughes and was taken on a Kodak DX6490 digital camera. Image post processed using iPhoto Plus4 and displayed at 96dpi. 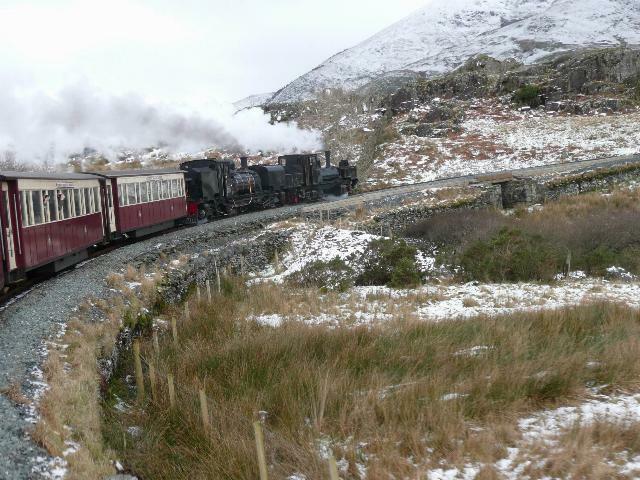 This northerly view (27/12/10) shows No.138 with Castell Caernarfon at 1206, approaching Rhyd Ddu with snow still lying on the ground. Click on the image to enlarge. This image is copyright Barrie Hughes and was taken on a Kodak DX6490 digital camera. Image post processed using iPhoto Plus4 and displayed at 96dpi. This northerly view (27/12/10) shows Castell Caernarfon at 1255, arriving at Beddgelert with snow still lying on the ground. Click on the image to enlarge. This image is copyright Barrie Hughes and was taken on a Kodak DX6490 digital camera. Image post processed using iPhoto Plus4 and displayed at 96dpi. 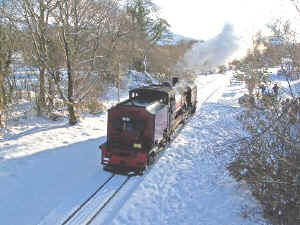 This southerly view (27/12/10) shows No.138 at 1301, having arrived at Beddgelert on the rear end of the train as the loop was out of use due to icing of the point mechanism. Click on the image to enlarge. This image is copyright Barrie Hughes and was taken on a Kodak DX6490 digital camera. Image post processed using iPhoto Plus4 and displayed at 96dpi. 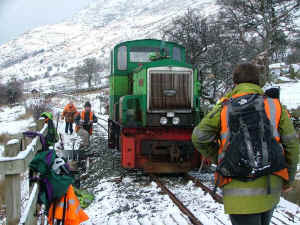 This northerly view (27/12/10) shows No.138 at 1304, with the driver trying to open the valve on the water crane at Beddgelert. Click on the image to enlarge. This image is copyright Barrie Hughes and was taken on a Kodak DX6490 digital camera. Image post processed using iPhoto Plus4 and displayed at 96dpi. 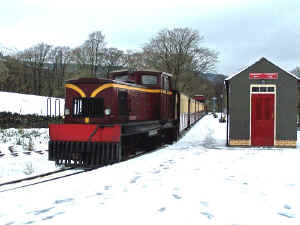 This northerly view (27/12/10) shows No.138 at 1308 at Beddgelert, with the chimney placed under the valve on the water crane to try and warm and free the valve (unsuccessfully). The loco had to water at Rhyd Ddu. Click on the image to enlarge. This image is copyright Barrie Hughes and was taken on a Kodak DX6490 digital camera. Image post processed using iPhoto Plus4 and displayed at 96dpi. Castell Caernarfon made a line inspection run from Caernarfon to Beddgelert on 26/12/10 to see if services could go as far as Pont Croesor as timetabled on 27/12/190. Snow over 30cm deep was encountered in places but the Funkey's cowcatcher swept this aside with ease. However, large icicles were encountered on the cutting sides in Cutting Mawr and the approaches to Goat Cutting. 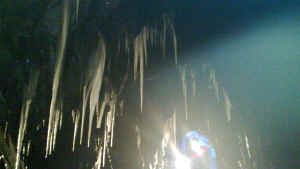 Goat Tunnel proved impassable as large stalactites hung from the ceiling and stalagmites had grown up from the floor and even the rails. 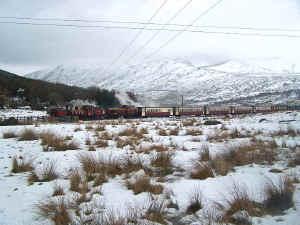 It was decided to turn the trains around at Beddgelert on 27-28/12/10 as a result until the thaw that started on the Friday had eased the situation. 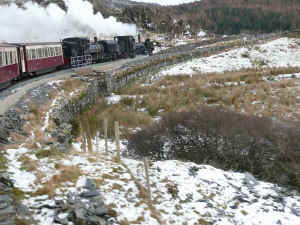 This northerly view (26/12/10) shows Castell Caernarfon at 1323, just south of Clogwyn-y-gwin, on the line inspection special. Click on the image to enlarge. This image is copyright Phil Brown (FR) and was taken on a digital camera. Image post processed using iPhoto Plus4 and displayed at 96dpi. This northerly view (26/12/10) shows Castell Caernarfon at 1439, in Cutting Mawr, with metre long icicles hanging from the cutting side. Click on the image to enlarge. This image is copyright Phil Brown (FR) and was taken on a digital camera. Image post processed using iPhoto Plus4 and displayed at 96dpi. 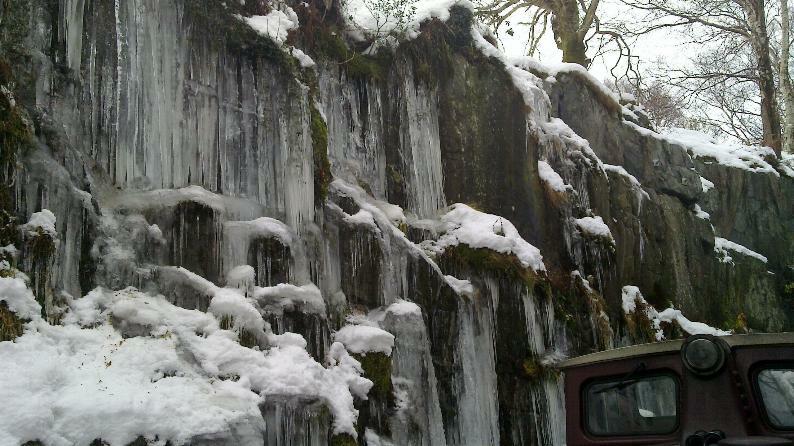 This southerly view (26/12/10) shows the state of Goat Cutting, with metre long icicles hanging from the cutting side. Click on the image to enlarge. This image is copyright Phil Brown (FR) and was taken on a digital camera. Image post processed using iPhoto Plus4 and displayed at 96dpi. This view (26/12/10) shows the state of Goat Tunnel, with 30cm high ice stalagmites growing on the rail. Click on the image to enlarge. This image is copyright Phil Brown (FR) and was taken on a digital camera. Image post processed using iPhoto Plus4 and displayed at 96dpi. 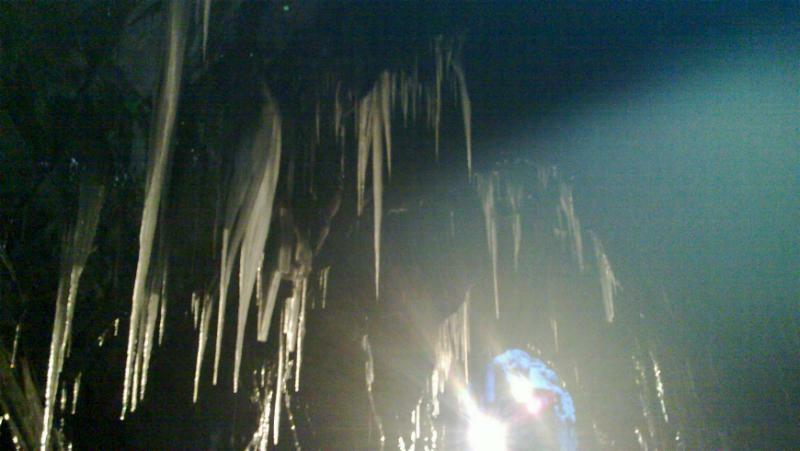 This view (26/12/10) shows the state of Goat Tunnel, with metre long ice stalactites hanging from the tunnel roof, illuminated by the Funkey's headlamp. Click on the image to enlarge. This image is copyright Phil Brown (FR) and was taken on a digital camera. Image post processed using iPhoto Plus4 and displayed at 96dpi. A further significant snowfall is forecast for the mountains of North Wales on Sunday overnight as the weather begins to warm up (by up to 9 degrees forecast at Porthmadog on Wednesday! ), but may be sleet/rain in Porthmadog. Monday will probably see lying snow around the WHR, especially at higher altitudes, with some drizzle and the weather may be cloudy until Thursday. 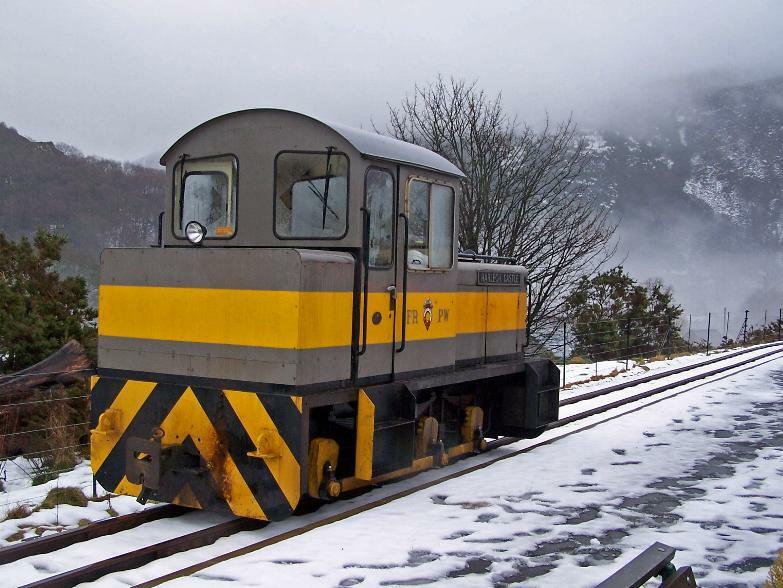 The FR website advises that after a line inspection on Sunday, the advertised 1100 Caernarfon-Pont Croesor and 1330 return is likely to run on Monday, though with delays due to the weather. See FR website. So keep checking on the FR's Facebook or twitter pages for updates. Alternatively please call the booking office on 01766 516024. Click on the YouTube box above to watch 1 minute 15 seconds of video of No.138 accelerating away from Plas Bodaden on 23/12/10 in the snow, working the first Santa Special of the final day of operation. The YouTube clip is best watched at 1080p HD standard. This video was taken by Barrie Hughes on a Panasonic SD700 HD camcorder. This northerly view (23/12/10) shows No.138 with Castell Caernarfon at 1042, just south of Hendy Crossing, on the first train of the final day of Santa Specials. No.138 was substituting for the booked K1. Click on the image to enlarge. This image is copyright Barrie Hughes and was taken on a Kodak DX6490 digital camera. Image post processed using iPhoto Plus4 and displayed at 96dpi. 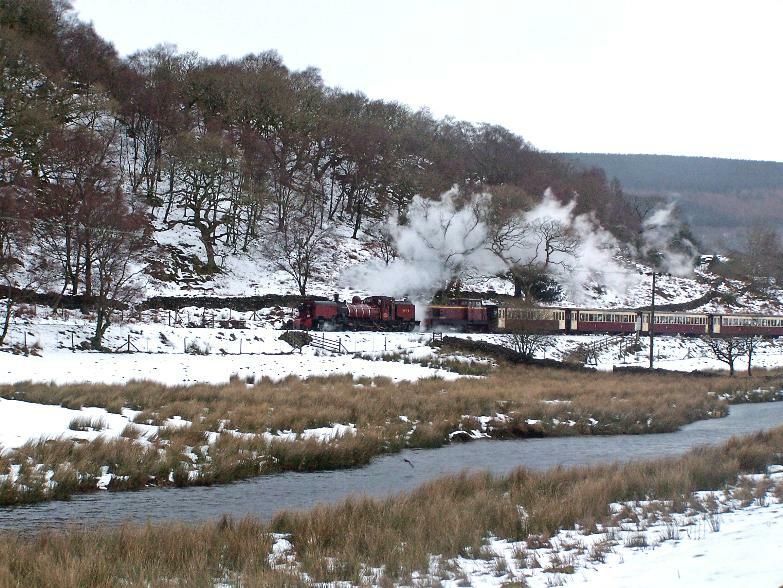 This westerly view (23/12/10) shows No.138 with Castell Caernarfon at 1105, at Plas Bodaden, on the first train of the final day of Santa Specials. Click on the image to enlarge. This image is copyright Barrie Hughes and was taken on a Kodak DX6490 digital camera. Image post processed using iPhoto Plus4 and displayed at 96dpi. This southerly view (23/12/10) shows No.138 at 1127, running around at Waunfawr, on the first train of the final day of Santa Specials. Exiting the car park in the snow can be tricky as it gets very icy! Click on the image to enlarge. This image is copyright Barrie Hughes and was taken on a Kodak DX6490 digital camera. Image post processed using iPhoto Plus4 and displayed at 96dpi. This northerly view (23/12/10) shows No.138 at 1128, pausing for refreshments whilst running around at Waunfawr, on the first train of the final day of Santa Specials. Click on the image to enlarge. This image is copyright Barrie Hughes and was taken on a Kodak DX6490 digital camera. Image post processed using iPhoto Plus4 and displayed at 96dpi. This northerly view (23/12/10) shows Castell Caernarfon at 1156, on the rear of a Santa Specials. Click on the image to enlarge. This image is copyright Barrie Hughes and was taken on a Kodak DX6490 digital camera. Image post processed using iPhoto Plus4 and displayed at 96dpi. This northerly view (23/12/10) shows No.138 at 1255, running a little late after a stop near the Carriage Shed, on the second train of the final day of Santa Specials. Click on the image to enlarge. This image is copyright Barrie Hughes and was taken on a Kodak DX6490 digital camera. Image post processed using iPhoto Plus4 and displayed at 96dpi. This westerly view (23/12/10) shows No.138 at 1329, arriving at Waunfawr, on the second train of the final day of Santa Specials. Click on the image to enlarge. This image is copyright Barrie Hughes and was taken on a Kodak DX6490 digital camera. Image post processed using iPhoto Plus4 and displayed at 96dpi. 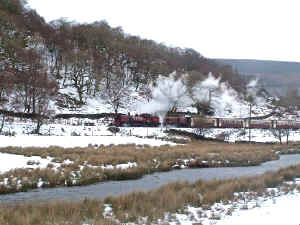 This easterly view (23/12/10) shows No.138 at 1403, running a little late, on the second train of the final day of Santa Specials. This area has become overgrown reducing photographic opportunities. Click on the image to enlarge. This image is copyright Barrie Hughes and was taken on a Kodak DX6490 digital camera. Image post processed using iPhoto Plus4 and displayed at 96dpi. 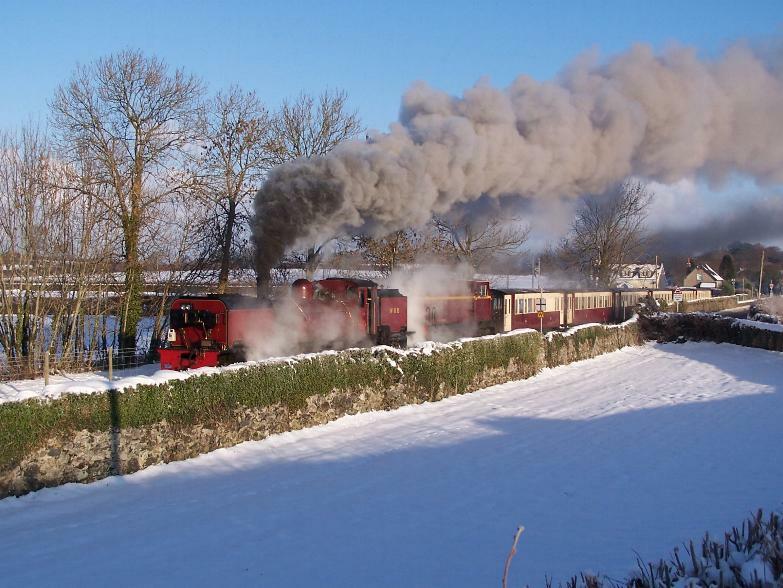 This northerly view (23/12/10) shows No.138 at 1444, departing Caernarfon a little late, on the last Santa Specials of 2010. Click on the image to enlarge. This image is copyright Barrie Hughes and was taken on a Kodak DX6490 digital camera. Image post processed using iPhoto Plus4 and displayed at 96dpi. 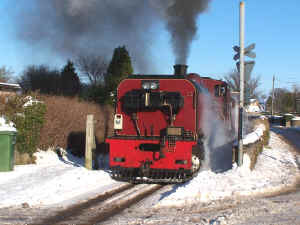 Click on the YouTube box above to watch 1 minute 7 seconds of video of No.138 accelerating away from Hendy crossing on 23/12/10 in the snow, working the first Santa Special of the final day of operation. The YouTube clip is best watched at 1080p HD standard. This video was taken by Barrie Hughes on a Panasonic SD700 HD camcorder. 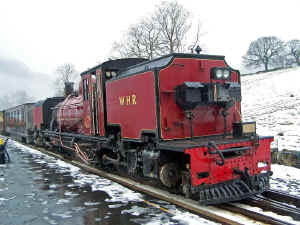 The locos involved on 22-23/12/10 Santa Specials will probably be K1 and Castell Caernarfon. The latest news at 0930 on 22/12/10 is that the first WHR train will run following a track inspection. Lying snow for Xmas trains? There is the possibility that there will be snow on the WHR when it operates its through trains to Pont Croesor from 27/12/10. Temperatures are likely to rise to 3 degrees by 26/12/10, after being below zero to 23/12/10, and sunny weather is likely for the period 24-26/12/10, implying a slow thaw. There is just one daily train, the 1100 from Caernarfon and the 1330 return. 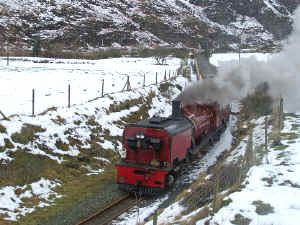 The train passes Rhyd Ddu, the location most likely to retain snow at 1205/1425. At the very least, the mountains will provide an alpine snow covered backdrop. Check the Meteorological Office website forecast for full details. 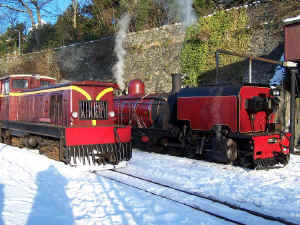 The locos involved on the Xmas service will probably be No.138 and Castell Caernarfon but K1 and Castell Caernarfon were used on 11-12/12/10 Santa Specials. Click on the YouTube box above to watch 57 seconds of video of No.138 approaching Cae Moel on 19/12/10 in the snow, working the first Santa Special of the day. The YouTube clip is best watched at 1080p HD standard. This video was taken by Barrie Hughes on a Panasonic SD700 HD camcorder. Your webmaster is accumulating some hours of HD video that will be edited into DVD/BD formats over Xmas. The Panasonic SD700 is generating excellent 1080p quality video and Dolby stereo sound even in challenging light conditions. Battery life is very good and 16GB SDHC Class 4 cards are expensive but can be used thousands of times. They provide 90 mins record time in 1080p quality mode. Monies raised from the sale of these DVD/BDs will go to the WHRS to support their contribution to the Phase 5 appeal. 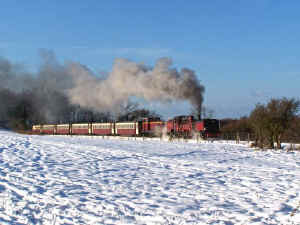 All day brilliant sunshine and six inches of snow were present on the WHR on 19/12/10 and all three Santa Specials ran. The mode of operation is as follows. Castell Caernarfon draws the rake out of the Carriage Shed and shunts it into the southbound platform. No.138 arrives from the Loco Shed runs past the train and shunts onto the front of the rake. The assemblage then departs for Caernarfon at about 1000. 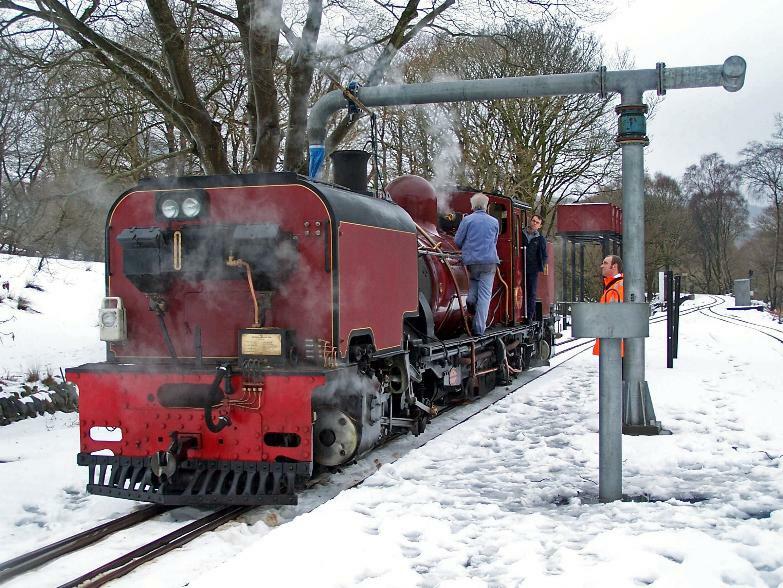 At Caernarfon, No.138 runs around and waters so the rake is double headed uphill to Waunfawr. At Waunfawr, No.138 runs around and leads the rake back to Caernarfon with the Funkey on the rear. For the ECS at the end of the day, the rake stops adjacent to the Carriage Shed and No.138 shunts off to refuel. The Funkey drags the rake into the headshunt and propels it back to the Carriage Shed. Finally No.138 shunts to the Loco Shed. There are two more days of operation on 22-23/12/10 and the Caernarfon Station shop is open for business all day. Snow is likely to lie on the ground on those days as some 15cm was present on 19/12/10 with little sign of melting and forecast temperatures not rising until 22-23/12/10. The main roads are clear and your editor had no problem driving 200 miles along the A14/M6/M56/A55 route. 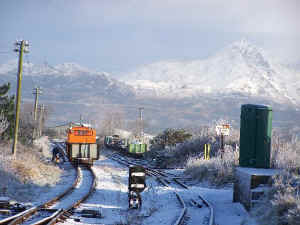 This northerly view (19/12/10) shows the snowbound Dinas with Castell Caernarfon at 0954 having drawn the ECS out of the sidings. 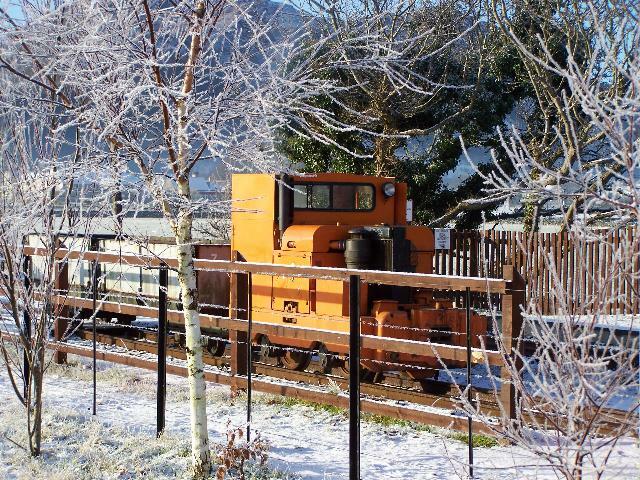 The Funkey's cowcatcher is an effective snow plough! Click on the image to enlarge. This image is copyright Barrie Hughes and was taken on a Kodak DX6490 digital camera. Image post processed using iPhoto Plus4 and displayed at 96dpi. 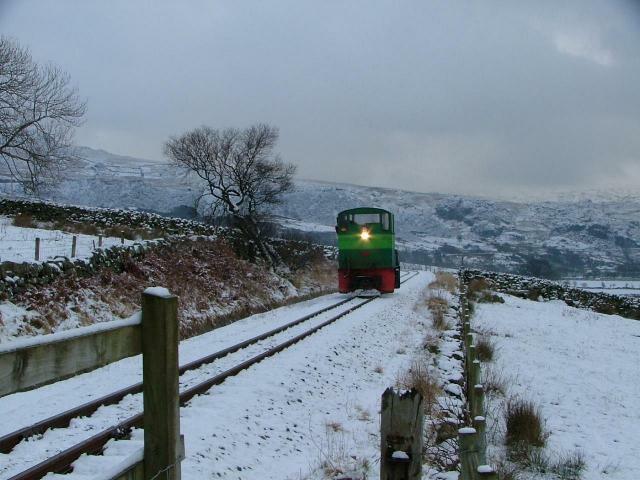 This southerly view (19/12/10) shows the snowbound Dinas with No.138 running into the station from the Loco Shed. The Garratt's cowcatcher ploughs a strip almost 6 feet wide! Click on the image to enlarge. This image is copyright Barrie Hughes and was taken on a Kodak DX6490 digital camera. Image post processed using iPhoto Plus4 and displayed at 96dpi. 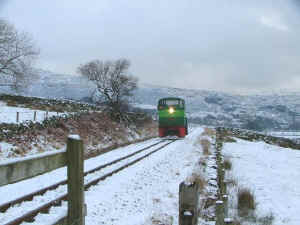 This northerly view (19/12/10) shows No.138 reversing onto its train at Dinas. Click on the image to enlarge. This image is copyright Barrie Hughes and was taken on a Kodak DX6490 digital camera. Image post processed using iPhoto Plus4 and displayed at 96dpi. This northerly view (19/12/10) shows the No.138 departing ECS for Caernarfon at 1005 from the southbound platform. Click on the image to enlarge. This image is copyright Barrie Hughes and was taken on a Kodak DX6490 digital camera. Image post processed using iPhoto Plus4 and displayed at 96dpi. This northerly view (19/12/10) shows the snowbound Dinas with the second Shotton loco ready to depart for LOROL. Click on the image to enlarge. This image is copyright Barrie Hughes and was taken on a Kodak DX6490 digital camera. Image post processed using iPhoto Plus4 and displayed at 96dpi. 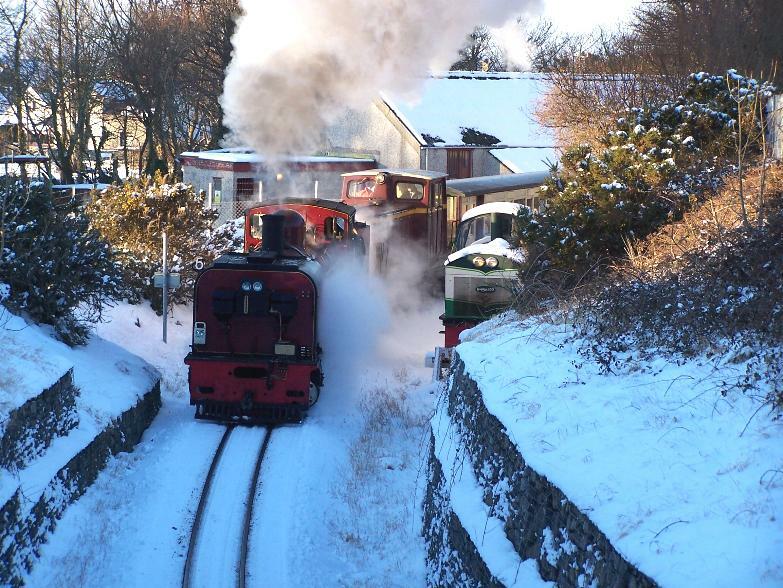 This northerly view (19/12/10) shows the snowbound Caernarfon with No.138 taking water at 1022. 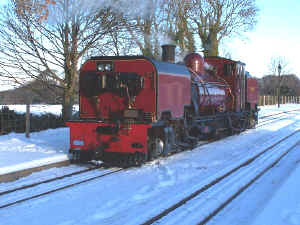 The Garratt ran around the first train of the day to lead Castell Caernarfon to Waunfawr. The Funkey's cowcatcher is an effective snow plough! Click on the image to enlarge. This image is copyright Barrie Hughes and was taken on a Kodak DX6490digital camera. Image post processed using iPhoto Plus4 and displayed at 96dpi. This northerly view (19/12/10) shows No.138 running around the Santa Special. Click on the image to enlarge. This image is copyright Barrie Hughes and was taken on a Kodak DX6490 digital camera. Image post processed using iPhoto Plus4 and displayed at 96dpi. This backlit southerly view (19/12/10) shows No.138 shunting onto the Santa Special. Click on the image to enlarge. This image is copyright Barrie Hughes and was taken on a Kodak DX6490 digital camera. Image post processed using iPhoto Plus4 and displayed at 96dpi. This northerly view (19/12/10) shows No.138 coupled up to the Santa Special at 1037, a few minutes late from the booked 1030 departure time. Click on the image to enlarge. This image is copyright Barrie Hughes and was taken on a Kodak DX6490 digital camera. Image post processed using iPhoto Plus4 and displayed at 96dpi. This westerly view (19/12/10) shows No.138 double heading Castell Caernarfon passing Cae Moel on the Santa Special at 1059. Click on the image to enlarge. This image is copyright Barrie Hughes and was taken on a Kodak DX6490 digital camera. Image post processed using iPhoto Plus4 and displayed at 96dpi. 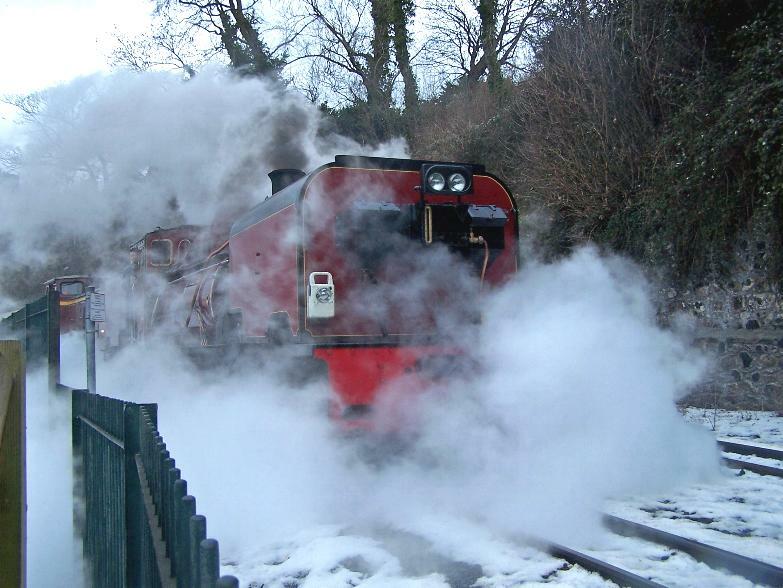 This southerly view (19/12/10) shows No.138 running around after taking water at Waunfawr at 1126. There was about 20cm of snow here and the points needed to be unblocked to close properly to complete the run round at the north end. Click on the image to enlarge. This image is copyright Barrie Hughes and was taken on a Kodak DX6490 digital camera. Image post processed using iPhoto Plus4 and displayed at 96dpi. 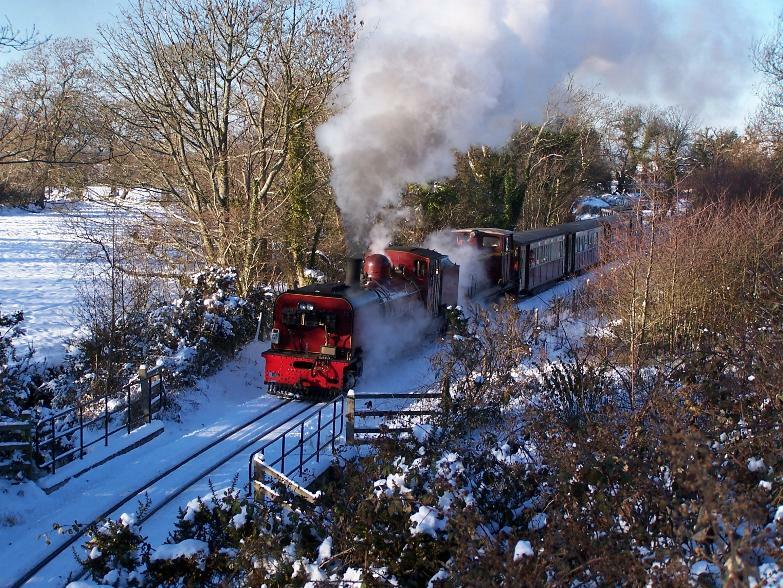 This southerly view (19/12/10) shows No.138 coupled up to the Santa Special, ready to depart Waunfawr. Click on the image to enlarge. This image is copyright Barrie Hughes and was taken on a Kodak DX6490 digital camera. Image post processed using iPhoto Plus4 and displayed at 96dpi. This southerly view (19/12/10) shows No.138 departing Waunfawr at 1141. Click on the image to enlarge. This image is copyright Barrie Hughes and was taken on a Kodak DX6490 digital camera. Image post processed using iPhoto Plus4 and displayed at 96dpi. This southerly view (19/12/10) shows No.138 having arrived at Caernarfon with time to run round before the 1230 departure despite the earlier late running. Click on the image to enlarge. This image is copyright Barrie Hughes and was taken on a Kodak DX6490 digital camera. Image post processed using iPhoto Plus4 and displayed at 96dpi. 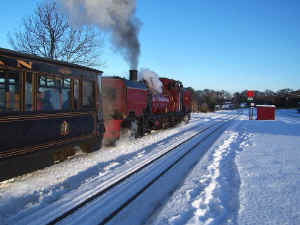 This southerly view (19/12/10) shows No.138 running around the Santa Special at 1215, ready for the 1230 departure time. Click on the image to enlarge. This image is copyright Barrie Hughes and was taken on a Kodak DX6490 digital camera. Image post processed using iPhoto Plus4 and displayed at 96dpi. This northerly view (19/12/10) shows the No.138 at Hendy Crossing at 1237 with the second train of the day. Click on the image to enlarge. This image is copyright Barrie Hughes and was taken on a Kodak DX6490 digital camera. Image post processed using iPhoto Plus4 and displayed at 96dpi. 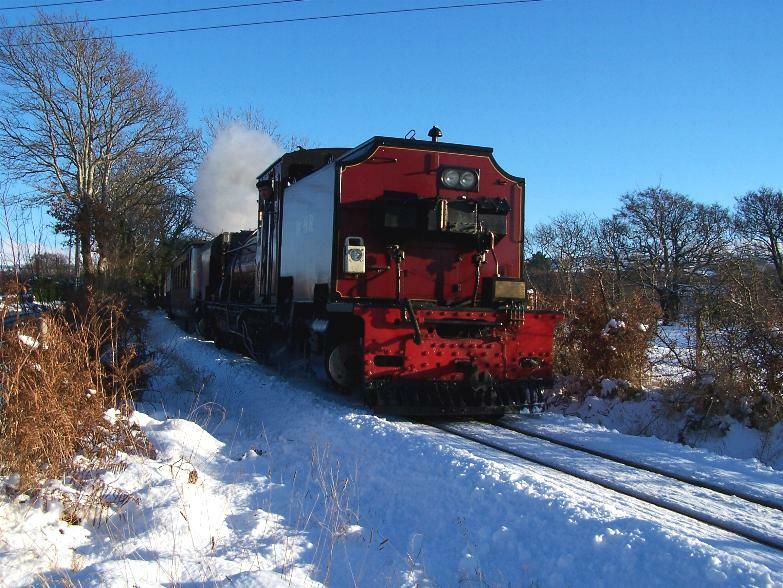 This easterly view (19/12/10) shows the No.138 at Rhostryfan Road at 1345 with the second train of the day. Click on the image to enlarge. This image is copyright Barrie Hughes and was taken on a Kodak DX6490 digital camera. Image post processed using iPhoto Plus4 and displayed at 96dpi. 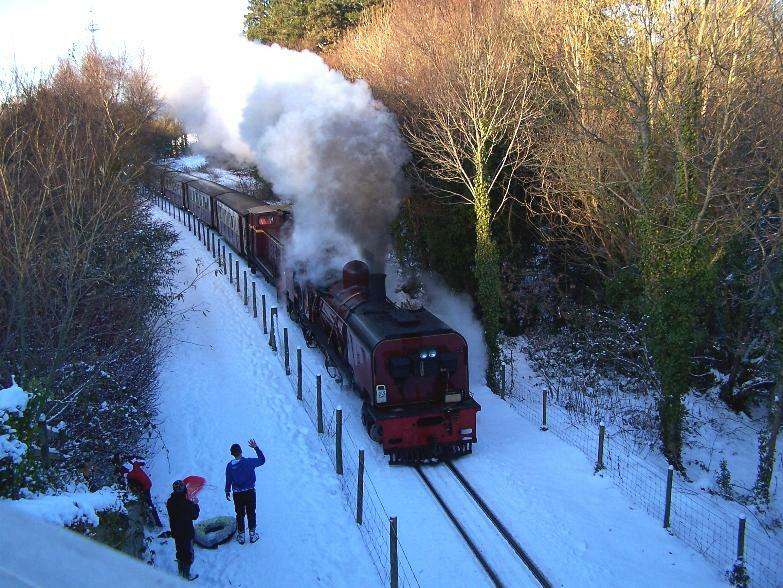 This southerly view (19/12/10) shows the No.138 at St. Helen's Road at 1404 with the second train of the day. Click on the image to enlarge. This image is copyright Barrie Hughes and was taken on a Kodak DX6490 digital camera. Image post processed using iPhoto Plus4 and displayed at 96dpi. 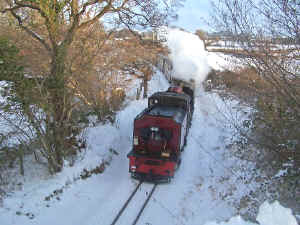 This northerly view (19/12/10) shows the No.138 at St. Helen's Road at 1435 with the final train of the day, which left on time. Local lads with their sledges offer a friendly wave. Click on the image to enlarge. This image is copyright Barrie Hughes and was taken on a Kodak DX6490 digital camera. Image post processed using iPhoto Plus4 and displayed at 96dpi. 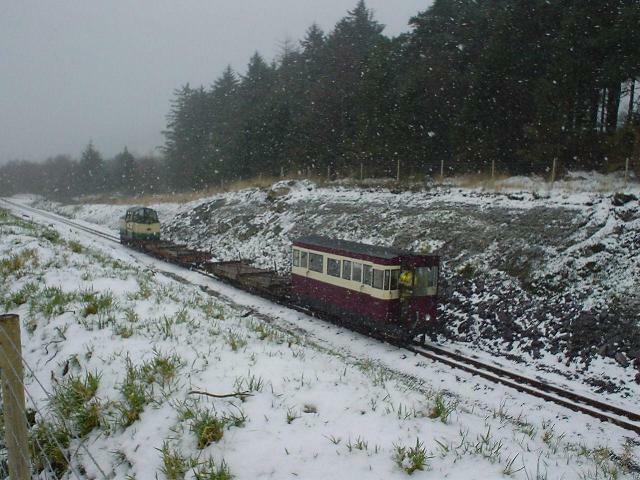 This westerly view (19/12/10) shows the No.138 at The Mount cutting at 1453 with the final train of the day. Conway Castle sits in the depot headshunt. Click on the image to enlarge. This image is copyright Barrie Hughes and was taken on a Kodak DX6490 digital camera. Image post processed using iPhoto Plus4 and displayed at 96dpi. This easterly view (19/12/10) shows the No.138 at The Mount cutting at 1545 with the final train of the day. Click on the image to enlarge. This image is copyright Barrie Hughes and was taken on a Kodak DX6490 digital camera. Image post processed using iPhoto Plus4 and displayed at 96dpi. Caernarfon in the snow 18/12/10! 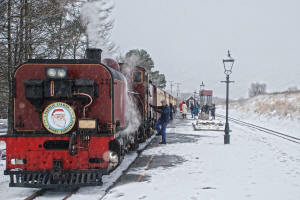 A heavy snowfall on 17/12/10 saw some 6 inches of snow around the WHR, even in Caernarfon. 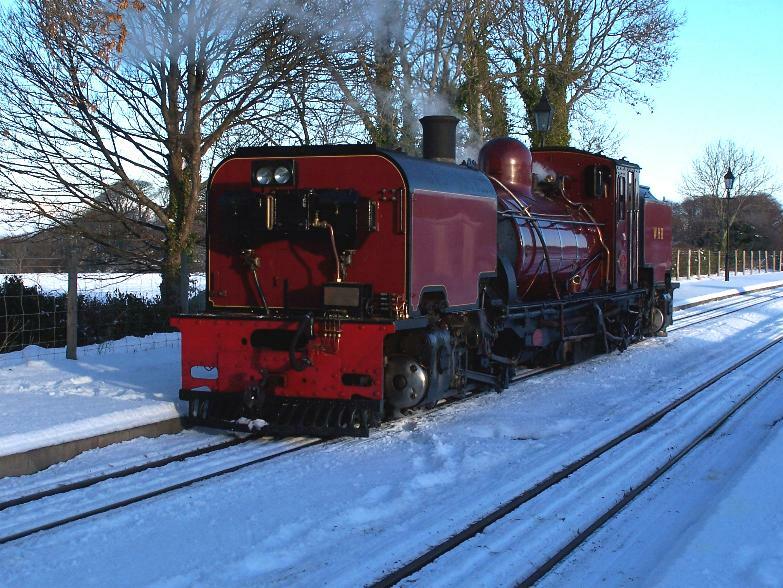 The Santa Trains from Caernarfon to Waunfawr on 18-19/12/10 are set to run in a winter wonderland as a cold sunny weather is forecast for the weekend! Trains depart Caernarfon at 1030/1230/1430. Any photos would be welcome. However a message on the FR website stated that the 1030 train is cancelled and Facebook/twitter links confirm the cancellation. The 1230 train will however run! 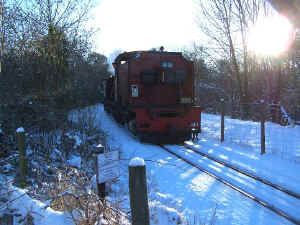 These northerly views (18/12/10) show No.138 running south alongside Rhostryfan Road with several inches of snow, presumably on the 1430. Click on the images to enlarge. These images are copyright Daniel Kirkman and were taken on a digital camera. Images post processed using iPhoto Plus4 and displayed at 96dpi. This northerly view (18/12/10) shows the snowbound Caernarfon. Click on the image to enlarge. This image is copyright Daniel Kirkman and was taken on a digital camera. Image post processed using iPhoto Plus4 and displayed at 96dpi. Simon Banbury reports: Work took place on the alignment in the snow near Snowdon Ranger and making a thorough job of cementing the inside of the cable box near the Cambrian Crossing. Though it looks very cold as long as you were not in the shade it was surprisingly warm. The temperature did fall rapidly as the sun went down. It also snowed on the hills every evening and then melted by midday. On 19/2/10 Upnor Castle arrived and saved us a long walk pushing our tools in a wheelbarrow after our alignment tasks on day 1 of the long weekend. Not as spectacular as steam against the snow, but a welcome arrival. We put all the bars and other heavy tools onto the engine and then carried the rest on foot to the next location we were working at. 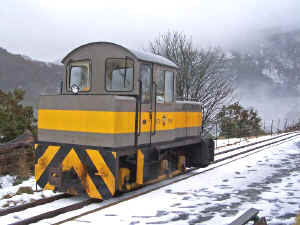 These southerly and northerly views (19/2/10) show Upnor Castle arriving light engine at the worksite just south of Snowdon Ranger in snowy conditions at 1030. Click on the images to enlarge. These images are copyright Simon Banbury and were taken on a digital camera. Images post processed using iPhoto Plus4 and displayed at 96dpi. 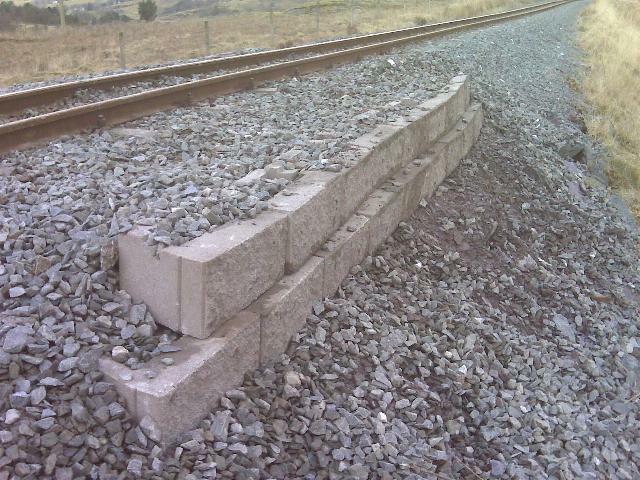 This northerly view (19/2/10) shows the unloading of retaining wall blocks near Snowdon Ranger. Click on the image to enlarge. This image is copyright Simon Banbury and was taken on a digital camera. Image post processed using iPhoto Plus4 and displayed at 96dpi. Tim Evans reports: The ROTWG installed another 2 cable access chambers one south and one north of Cae Pawb in the morning. Each of these were adjacent to the catch points, the northern set also being now fishplated back again by us as it was disconnected to facilitate installation of longer timbers to accommodate the point motor and other equipment. 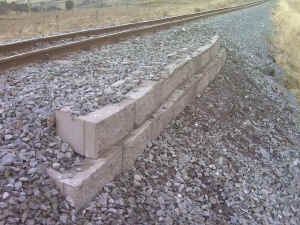 The sleepers of the connecting panel were also shovel packed as the catch point is now on thicker timbers than previously. The whole area requires the use of ballast wagons prior to tamping as nothing has been tipped since laying, though of relatively low priority compared to jobs needed on the operational section for this coming season. 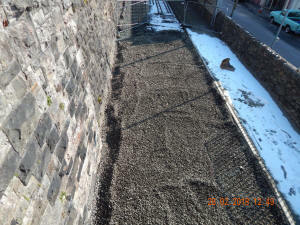 This northerly view (20/2/10) shows the excavation of a manhole for cables on the north side of Cae Pawb Crossing. Click on the image to enlarge. This image is copyright Simon Banbury and was taken on a digital camera. Image post processed using iPhoto Plus4 and displayed at 96dpi. In the afternoon we continued with ballast walling north of Rhyd Ddu. 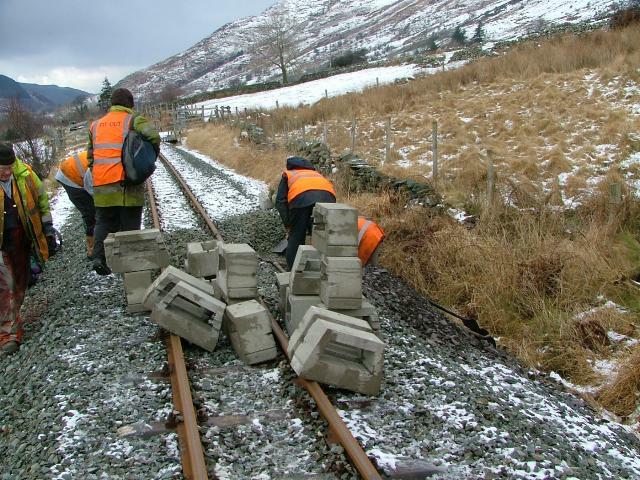 This northerly view (20/2/10) shows the retaining wall blocks near Rhyd Ddu. Click on the image to enlarge. This image is copyright Tim Evans and was taken on a digital camera. Image post processed using iPhoto Plus4 and displayed at 96dpi. 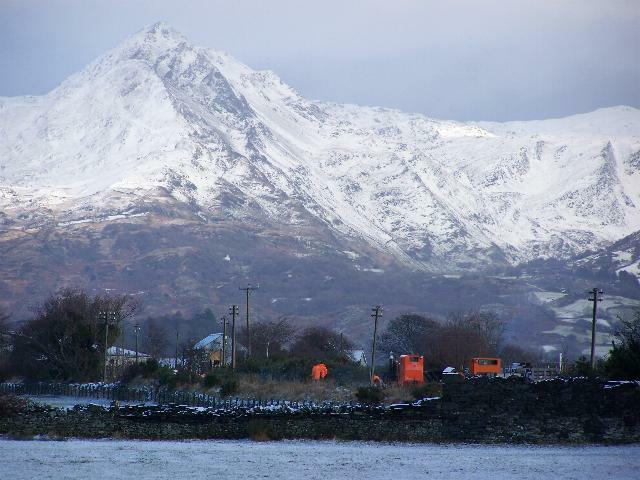 This northerly view (21/2/10) shows Rhyd Ddu with a snow covering in the morning. Click on the image to enlarge. This image is copyright Dr. Simon Melhuish and was taken on a Canon EOS 300D digital camera. Image post processed using iPhoto Plus4 and displayed at 96dpi. Castell Caernarfon is receiving attention in Dinas Yard. 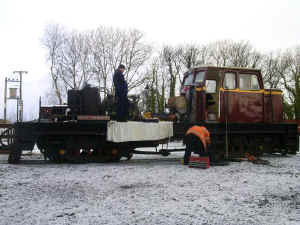 The loco bonnet has been removed and attention is being given to the gearbox. Both the Funkey diesels have transmission/gear box issues and are without key components at the moment. 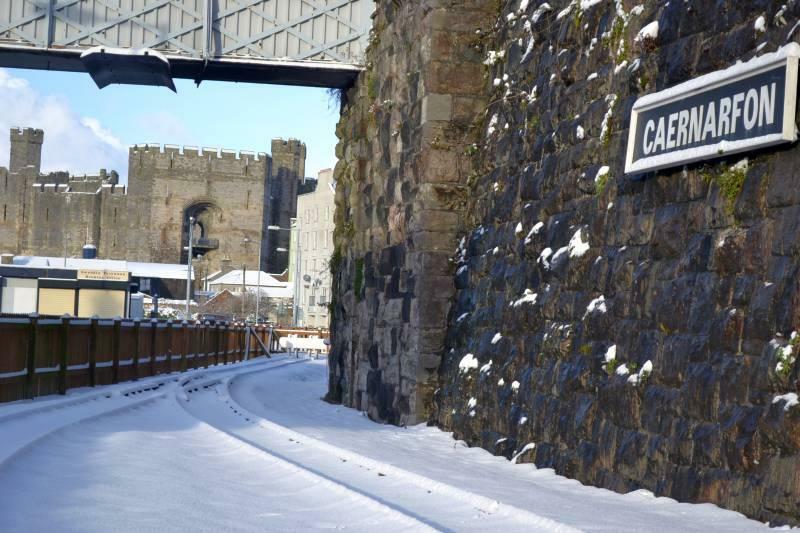 This westerly view (5/1/10) shows the maintenance of Castell Caernarfon at Dinas following a heavy snowfall. Click on the image to enlarge. This image is copyright Alasdair Stewart (WHRCL) and was taken on a digital camera. Image post processed using iPhoto Plus4 and displayed at 96dpi. No.87 is on ambulance bogies at the moment whilst its own bogies receive some Winter maintenance. This northerly view (6/1/10) shows the maintenance of No.87, now on accommodation bogies, at Dinas following a heavy snowfall. Click on the image to enlarge. This image is copyright Alasdair Stewart (WHRCL) and was taken on a digital camera. Image post processed using iPhoto Plus4 and displayed at 96dpi. 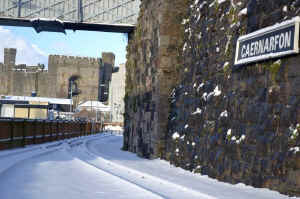 This southerly view (5/1/10) shows Conway Castle at Dinas following a heavy snowfall. Click on the image to enlarge. This image is copyright Alasdair Stewart (WHRCL) and was taken on a digital camera. Image post processed using iPhoto Plus4 and displayed at 96dpi. 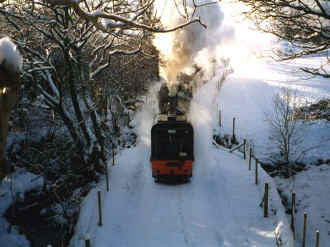 This clip shows No.143 charging up the Coed Helen bank on 31/12/00 in a rare snow scene and is Copyright 2006 by B.W.Hughes. This 27s clip does not represent the quality of the DVD! Click image when page has finished loading! Finally WHR in snow 2/1/10! The last day of the Winter service saw snow lying at Rhyd Ddu. Passenger services do not resume until 28/3/10 and snow is less likely at Easter. 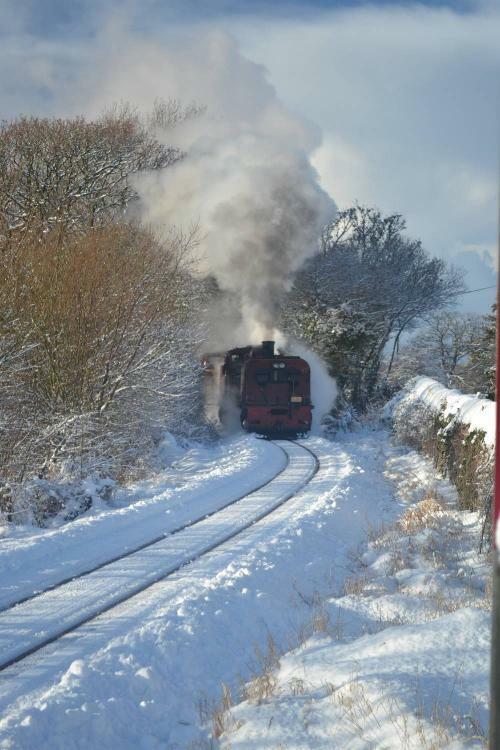 These southerly views (both 2/1/10) show K1 and No.143 rounding Ffridd Isaf curve in the snow on the final passenger train of the Winter service. 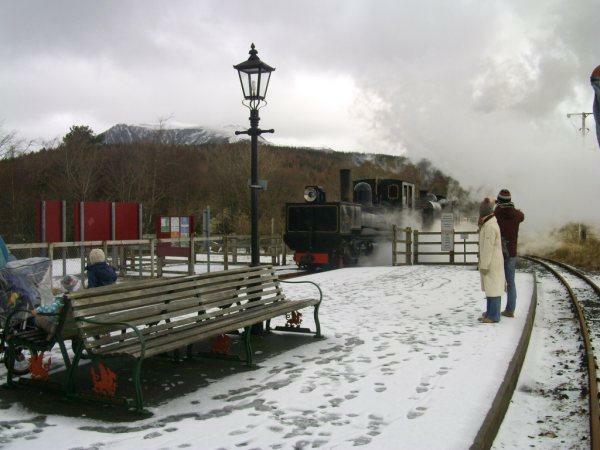 This was the first time there had been lying snow at Rhyd Ddu when a passenger train was running for many years. Click on the images to enlarge. These images are copyright Andy Keene and were taken on a digital camera. Images post processed using iPhoto Plus4 and displayed at 96dpi. These northerly and southerly views (both 2/1/10) show K1 and No.143 arriving at Rhyd Ddu on the final passenger train of the Winter service. The snow had almost disappeared by the time the train returned in the second photo. Click on the images to enlarge. These images are copyright Alasdair Stewart (WHRCL) and were taken on a digital camera. Images post processed using iPhoto Plus4 and displayed at 96dpi. 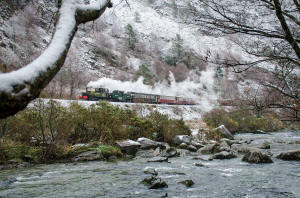 This northerly view (2/1/10) shows the No.143 leading K1 out of a snowy Beddgelert. Unusually, No.143 was leading on this final return journey of the season as on previous days K1 had been piloting so it could be removed easily at Dinas on return. Click on the image to enlarge. This image is copyright David Firth and was taken on a digital camera. Image post processed using iPhoto Plus4 and displayed at 96dpi. 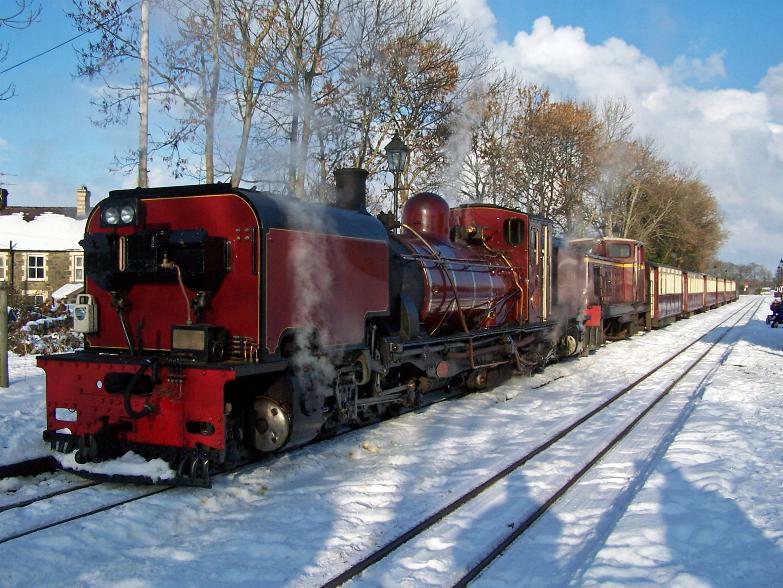 This easterly view (2/1/10) shows Blanche and Prince shunting at Harbour Station following a heavy snowfall. Click on the image to enlarge. This image is copyright Michael Chapman and was taken on a digital camera. Image post processed using iPhoto Plus4 and displayed at 96dpi. 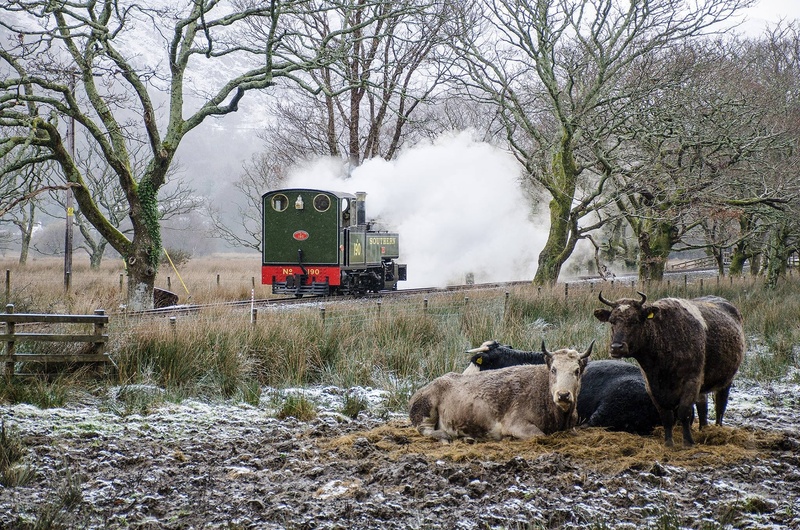 Chris Dearden reports: It snowed pretty hard in Porthmadog on the afternoon of New Year's Day for the first time since early 2000, and by next morning, there was still enough around for some nice pictures. Volunteers carried on working, finishing off relaying the main line. The job was almost complete, but needed a clear up train to remove old rails and scrap metal ...... something which wasn't easy to do with some of it buried under the snow! This northerly view (2/1/10) shows the orange Ruston diesel from Hoveringham Quarry heads up the line away from Gelert's Farm with a New Year works train. Click on the image to enlarge. This image is copyright Chris Dearden and was taken on a digital camera. Image post processed using iPhoto Plus4 and displayed at 96dpi. This westerly view (2/1/10) shows Simplex No.4 stands at Pen-y-Mount. Click on the image to enlarge. This image is copyright Chris Dearden and was taken on a digital camera. Image post processed using iPhoto Plus4 and displayed at 96dpi. This northerly view (2/1/10) shows Simplex No.4 pauses along the WHHR main line with a rail recovery train after re-laying over the Christmas holidays. Click on the image to enlarge. This image is copyright Chris Dearden and was taken on a digital camera. Image post processed using iPhoto Plus4 and displayed at 96dpi. This northerly view (2/1/10) shows the spiky form of Cnicht dominates the background as the works train pauses to collect scrap left over from the main line. Click on the image to enlarge. This image is copyright Chris Dearden and was taken on a digital camera. Image post processed using iPhoto Plus4 and displayed at 96dpi. 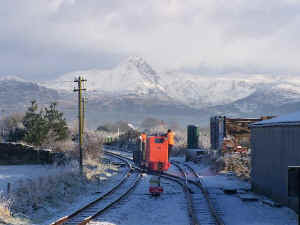 This northerly view (2/1/10) shows the spiky form of Cnicht viewed across the fields with the WHHR track gang and the works train becoming orange dots in a scene dominated by the Snowdonian mountains. Click on the image to enlarge. This image is copyright Chris Dearden and was taken on a digital camera. Image post processed using iPhoto Plus4 and displayed at 96dpi. 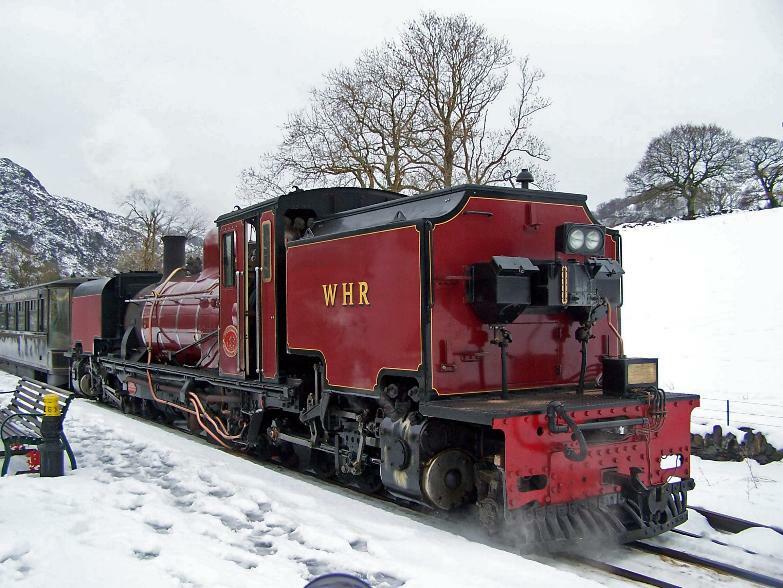 Andrew Goodwin was lucky with the snow on 1/1/10 and has kindly provided this YouTube clip of the WHHR. 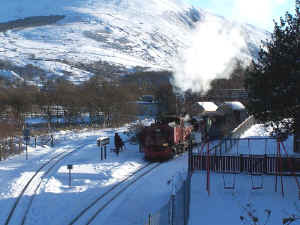 Click on the YouTube box above to watch 0 min 40 seconds of video of PW working at Gelert's Farm on 1/1/10 in the snow. This video was taken by Andrew Goodwin on a camcorder. Winter often brings snow to the mountains of Snowdonia but, since 2000, it has been rare to find it at lower levels around the railway. Snow can be found as late as March, but, by Easter, when services resume, only on the tops of the mountains. 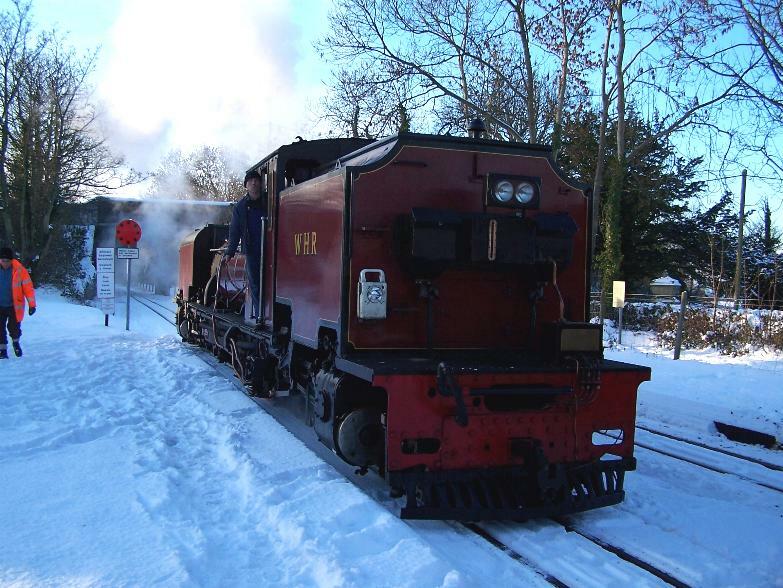 After the Xmas running during the period 26/12/07 to 1/1/08, there are two weeks of passenger services to from 9-21/2/08 (18/2/08 excepted). K1 is expected to haul the services. Any contributions of snow scenes to this website are welcome. Weather links are provided below along with a selection of previous snow images. This website will be updated throughout the Winter with snow shots as news/images become available. If snow falls, your webmaster will be off to North Wales to record trains in the snow! 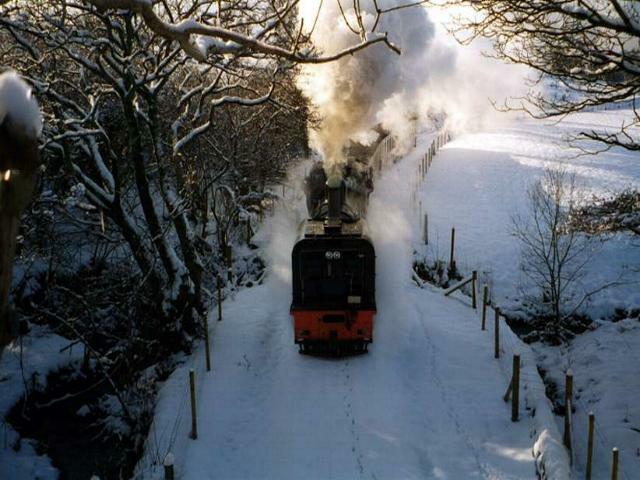 Winter 2000/1 was a good year for snow with a heavy snowfall in the Xmas holiday period and a long and difficult drive to photo WHR trains in the snow and the last diagrammed Class 37 on the North Wales Coast Line! 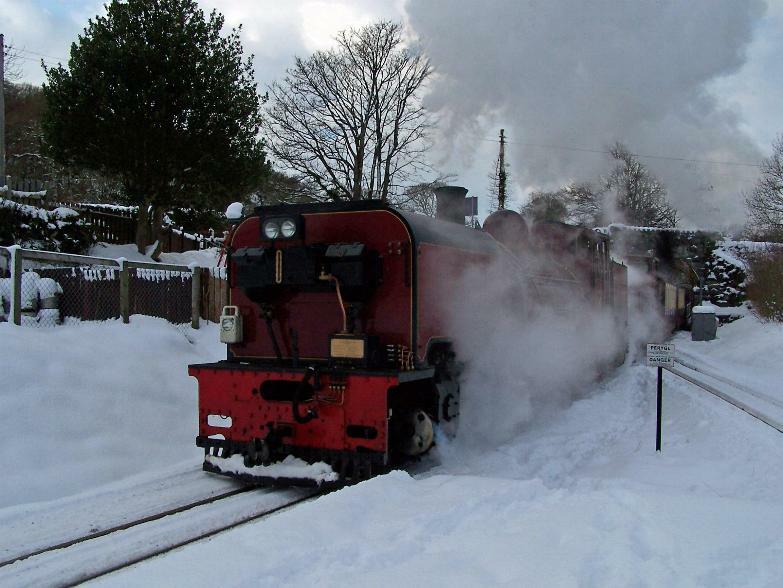 This clip shows No.143 going on shed at Dinas on 31/12/00 in a rare snow scene and is Copyright 2006 by B.W.Hughes. This 25s clip does not represent the quality of the DVD! Click image when page has finished loading! 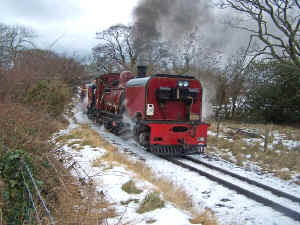 This clip shows No.143 at Cae'r Moel on 31/12/00 in a rare snow scene and is Copyright 2006 by B.W.Hughes. This 28s clip does not represent the quality of the DVD! Click image when page has finished loading! This northerly image (Xmas Holiday 2000/1) shows a rare snowfall at Caernarfon with No.143 about to depart. Click on the image to enlarge. This image is copyright Phil Wheeler, courtesy Richard Dungan. Image post processed using iPhoto Plus4 image correction technology and displayed at 96dpi. 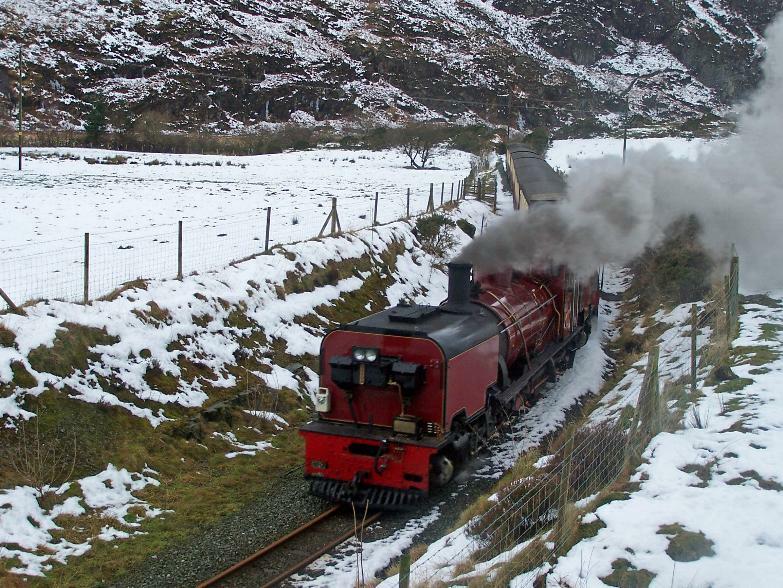 This westerly image (30/12/00) shows No.143 approaching Tryfan Junction on the first train of the day. Click on the image to enlarge. This image is copyright Jim Comerford, courtesy Ben Fisher. Image post processed using iPhoto Plus4 image correction technology and displayed at 96dpi. This southerly view (31/12/00) at Waunfawr shows No.143 paused for attention to the points while running round. Some of the problems of operating in the snow are illustrated. The point blades must be cleared of snow otherwise they will not close properly. Click on the image to enlarge. This image is copyright B.W.Hughes. Slide scanned at 200 dpi using Olympus ES10 and iPhoto Plus4 image correction technology. This northerly view (31/12/00) at the north end of Dinas shows No.143 arriving with the final Up train of the day. Click on the image to enlarge. This image is copyright B.W.Hughes. Slide scanned at 200 dpi using Olympus ES10 and iPhoto Plus4 image correction technology. This southerly view (31/12/00) at Dinas shows No.143 arriving with the final Down train of the day. Click on the image to enlarge. This image is copyright B.W.Hughes. Slide scanned at 200 dpi using Olympus ES10 and iPhoto Plus4 image correction technology. This northerly view (4/3/01) was taken by the volunteer track gang from LC23 as they started their weekend of work. No.143 was at the limit of Waunfawr headshunt. Click on the image to enlarge. This image is copyright Stan Owen. Image post processed using iPhoto Plus4 image correction technology and displayed at 96dpi. 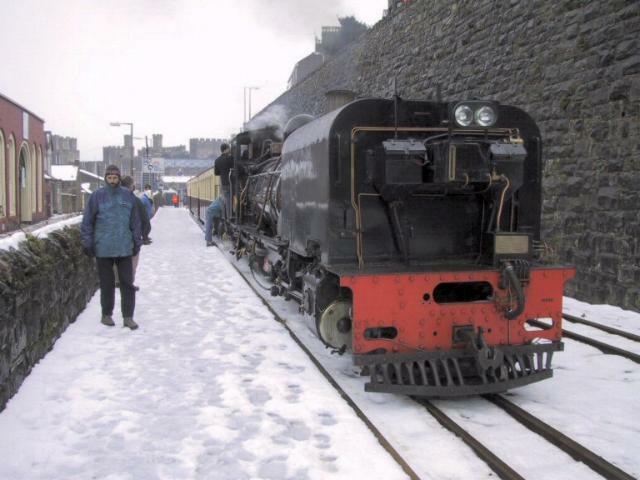 There appeared to be no snow on the WHR in Winter 2001/2 and 2002/3. At least no photos have come to hand! In Winter 2003/4, the heavy snowfalls in Snowdonia from 25/2/04 caused widespread disruption and there was even snow on the beach at Llandudno! Traffic during the half term holiday week was sparse as a result and trains were suspended on 26/2/04 as conditions were so severe. There was a bigger turnout for the weekend though with the weather clearing and blue skies everywhere illuminating a snowbound landscape. It is a pity the WHR was unable to turn out a steam loco as No.143 had recently been steam tested. The diagrammed loco Caernarfon Castle hauled the trains on 28/2/04 and was photographed extensively by Ben Fisher. The six coach rake included the Pullman and the Open coach, which was visited by some hardy photographers who were well wrapped up! This northerly view (28/2/04) shows Castell Caernarfon approaching Snowdon Ranger on the second train of the day. 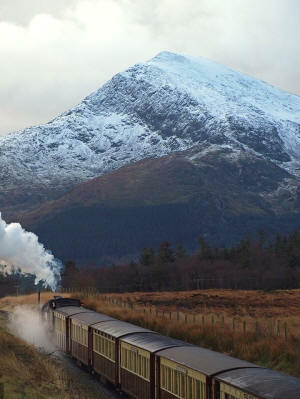 It is rare for snow to persist for long at the railway's altitude even though the peaks are often covered. Click on the image to enlarge. This image is copyright Ben Fisher and was taken on a digital camera. Image post processed using iPhoto Plus4 image correction technology and displayed at 96dpi. 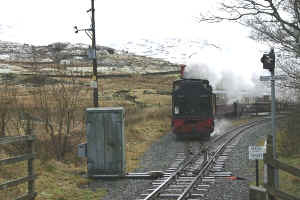 This southerly view (28/2/04) shows Castell Caernarfon approaching Cae Hywel l/c on the first train of the day. Click on the image to enlarge. This image is copyright Ben Fisher and was taken on a digital camera. Image post processed using iPhoto Plus4 image correction technology and displayed at 96dpi. This southerly view (28/2/04) shows an impressive snowscape from the platform at Snowdon Ranger with the Snowdon massif to the left and the Glan-yr-afon slate tips all covered in snow. Click on the image to enlarge. This image is copyright Ben Fisher and was taken on a digital camera. Image post processed using iPhoto Plus4 image correction technology and displayed at 96dpi. 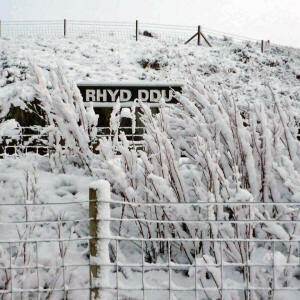 Winter 2004/5 saw snow fall at Dinas on Xmas Day! 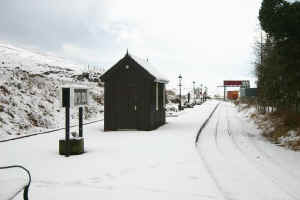 This northerly view (25/12/04) shows Dinas Station with an Xmas morning snowfall. The snow on the platforms had all melted by the afternoon. Click on the image to enlarge. This image is copyright Cliff Garnett and was taken on a digital camera. Image post processed using iPhoto Plus4 image correction technology and displayed at 96dpi. 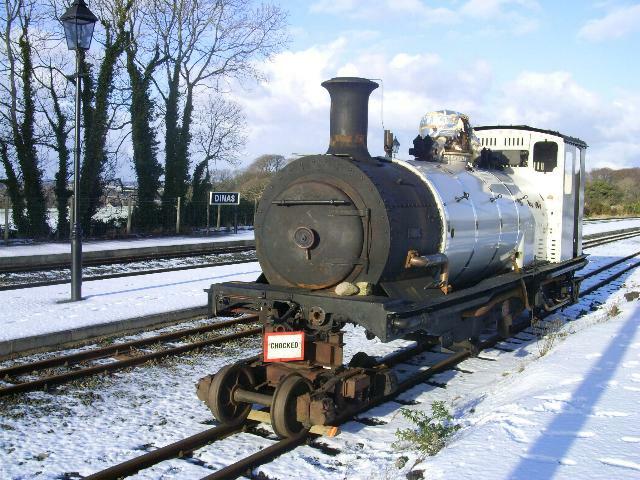 However, the Xmas Day snow on 25/12/04 had all melted by the time your webmaster got there the following day for the Boxing Day services!! This westerly view (26/12/04) at Ffridd Isaf curve shows No.138 with Castell Caernarfon inside leaving Rhyd Ddu with the snow covered summit of Y Garn (633m) visible behind. This was the best your webmaster got during the Winter of 2004/5 as snow rarely made it down to the railway! Maybe global warming? This image is used on the Phase 3 DVDs produced by your webmaster with all monies going to the WHRS. Click on the image to enlarge. This image is copyright B.W.Hughes and was taken on a Concord 3340z (3.1 Mega pixel) digital camera. Image post processed using iPhoto Plus4 image correction technology and displayed at 96dpi. Winter 2005/6 saw snow at Rhyd Ddu but no train images have come to hand. This northerly view (4/3/06) shows the Summit Cutting level with the snowclad mountains north of Snowdon visible behind. 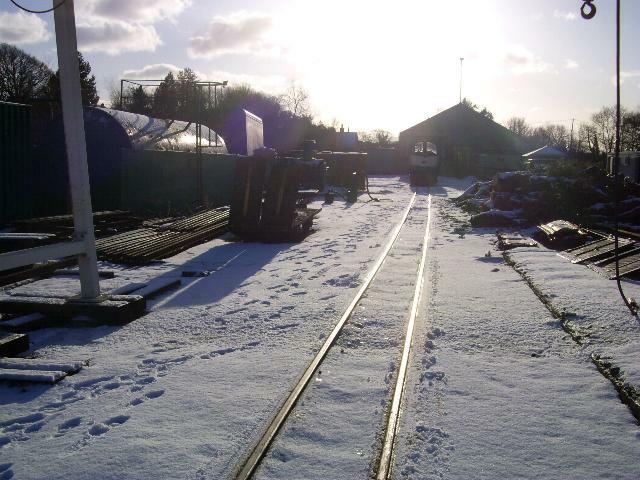 This will be a good spot for images of trains in the snow now track has been laid. The Imperial College Railway society had a trackbed walk as tracklaying was suspended. Click on the image to enlarge. This image is courtesy Kim Winter and was taken on an Olympus Camedia C-1400XL 1.4 million Pixels Progressive CCD 3 x Progressive. Image post processed using iPhoto Plus4 and displayed at 96dpi. Winter 2006/7 saw snow cover at a premium again! Andrew Goodwin (WHR(P)) was lucky to be around Phase 4 on 9/2/07 when a blizzard occurred and snow was briefly lying on Phase 4. He has kindly provided this sequence of photos of the rail train returning to Rhyd Ddu. 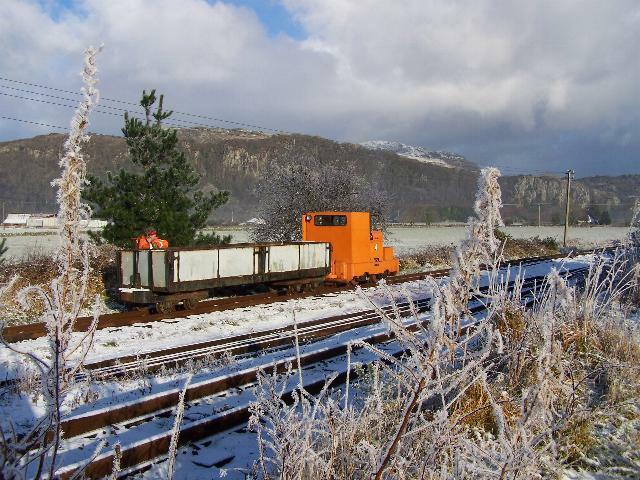 This southerly view (9/2/07) shows a rare snow shot of Phase 4 with Conway Castle reversing the rail train through Pont Cae'r Gors Cutting to Rhyd Ddu after delivering rail to Phase 4 for the weekend's tracklaying programme. Click on the image to enlarge. This image is courtesy/copyright Andrew Goodwin and was taken on a digital camera. Image post processed using iPhoto Plus4 and displayed at 96dpi. 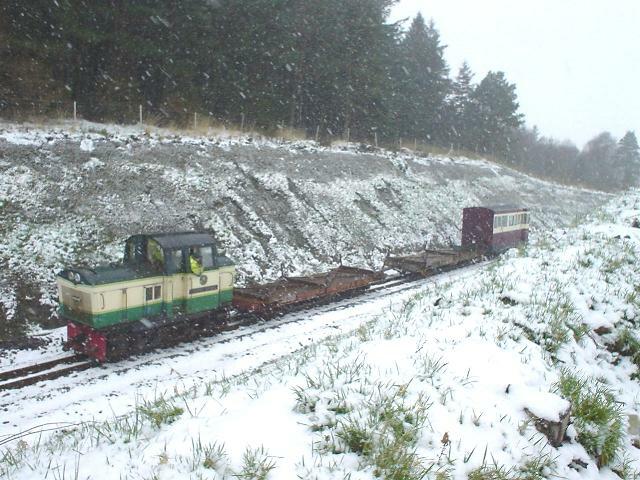 This northerly view (9/2/07) shows a rare snow shot of Phase 4 with Conway Castle reversing the rail bolster wagon and mess coach through Pont Cae'r Gors Cutting to Rhyd Ddu after delivering rail to Phase 4 for the weekend's tracklaying programme. Click on the image to enlarge. This image is courtesy/copyright Andrew Goodwin and was taken on a digital camera. Image post processed using iPhoto Plus4 and displayed at 96dpi. This easterly view (21/3/07) shows a rare view of the secret working of a test train for the 2007 Supporters' Special that a few days later ventured onto Phase 4. 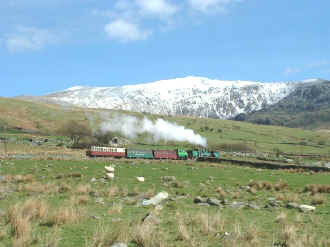 The train is pictured against a snow-clad summit of Snowdon, just south of Snowdon Ranger station. No.138 and Upnor Castle double head 3 older coaches. Click on the image to enlarge. This image is courtesy/copyright John Ewing and was taken on a digital camera. Image post processed using iPhoto Plus4 and displayed at 96dpi. Snow came late in 2007-8...in fact record high temperatures for a while and even Snowdon was bare of snow in most of January/February. Has global warming forever spoilt the snow shot? 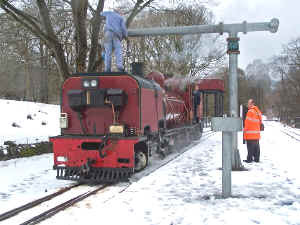 However, snow eventually came in March and April and K1 operated with its new lamp on 6/4/08 and was seen in the light smattering of snow at Rhyd Ddu before the snow rapidly melted away in the afternoon. 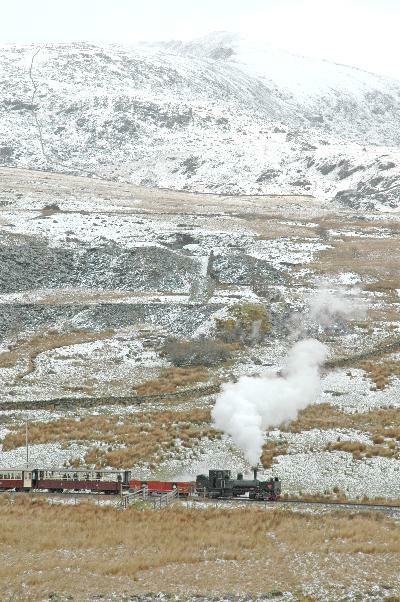 This easterly view (6/4/08) shows K1 approaching Ffridd Isaf Curve with Snowdon summit behind in a snowy dusted landscape. Click on the image to enlarge. This image is copyright Steve Sedgewick and was taken on a digital camera. Image post processed using iPhoto Plus4 and displayed at 96dpi. This easterly view (6/4/08) shows the K1 approaching Rhyd Ddu in a snowy dusted landscape. Click on the image to enlarge. This image is copyright Barrie Hughes and was taken on a Kodak DX6490 digital camera. Image post processed using iPhoto Plus4 and displayed at 96dpi. 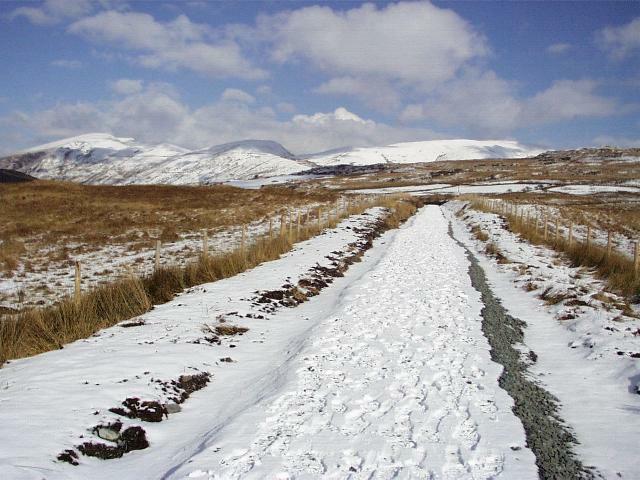 In Winter 2008-9 snow came early in October and almost reached down to Rhyd Ddu. The Xmas Service operated in dry but cold conditions. 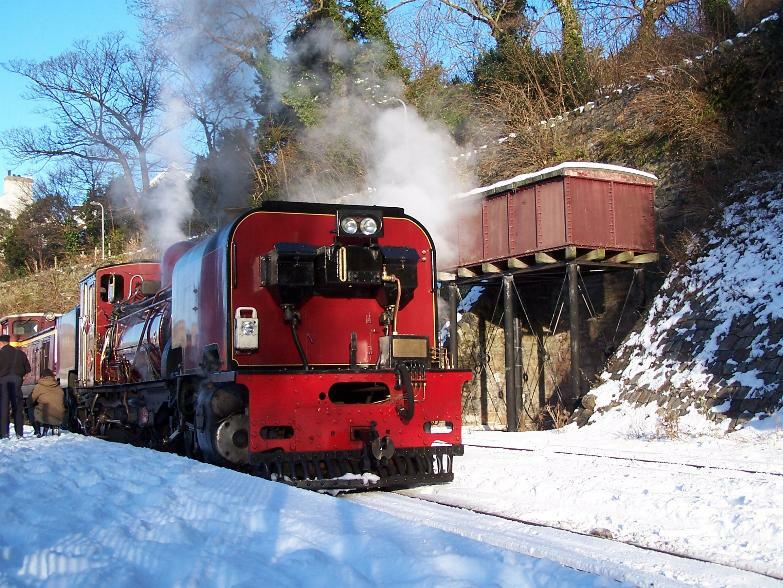 With trains operating during the Winter school holidays (only until 1/1/09 and from 28/3/09), here are some useful resources to check if there is snow at the WHR(C). First Hydro has four webcams in the Llanberis valley. If the one pointed at Llanberis shows snow, this would give a good indication of snow in the Gwyrfai valley as they are around the same height. However, it should be noted that snow cover generally decreases from east to west. Other useful resources include the A55 webcams. The Bangor webcam can be helpful though it is nearer sea level than the WHR(C). You will need to create an account and log in. These views refresh every five minutes rather than every minute as in previous years, giving time for them to be shut off if an incident occurs. 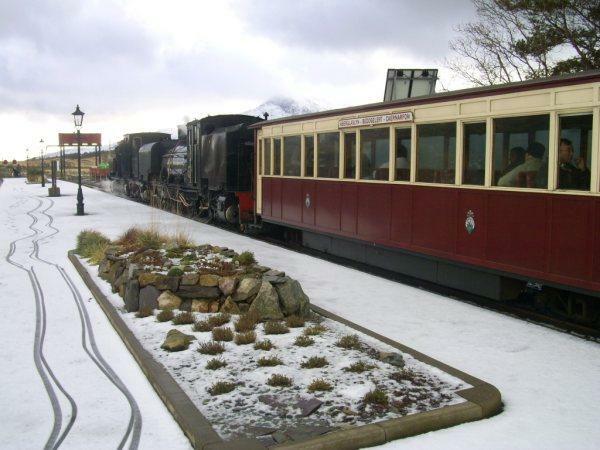 The WHR(P) webcams would show the rare sea level snow cover at Porthmadog. The Meteorological Office provides a useful animated radar weather map covering the last 6 hours that shows the rain/snow coming into Britain and can be watched as an animation updated every 30 minutes. The main Meteorological Office website also has a Wales page that shows the predicted weather for the Porthmadog area for the next five days.